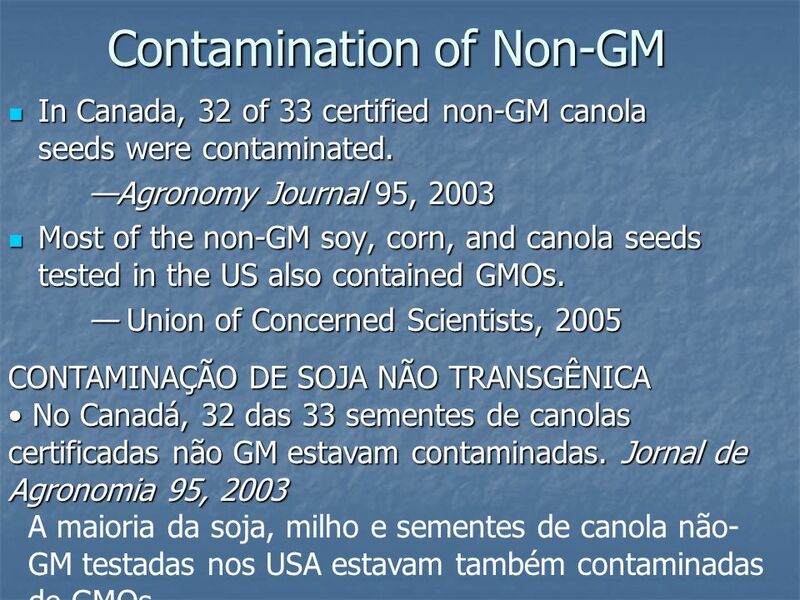 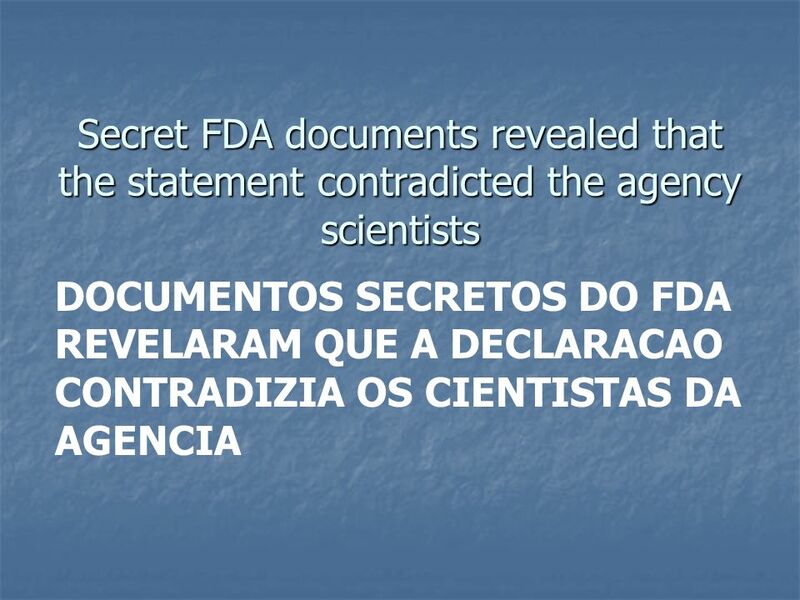 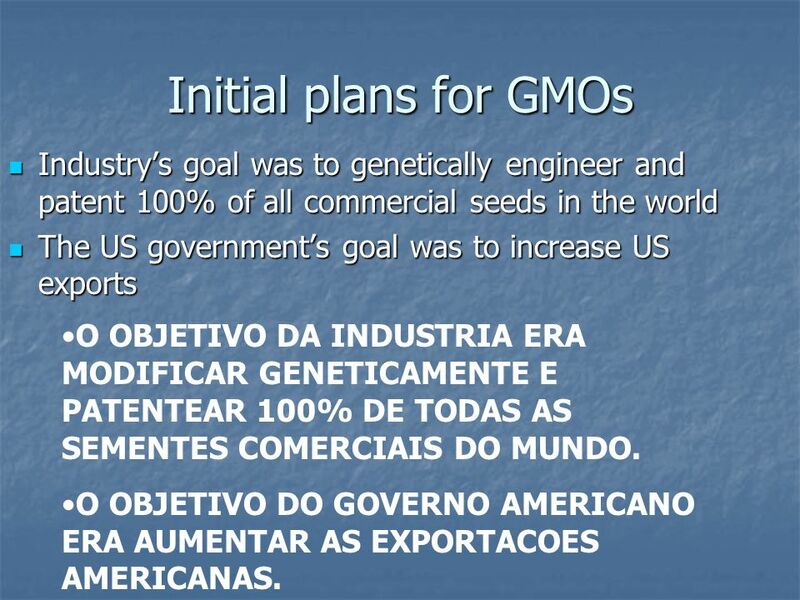 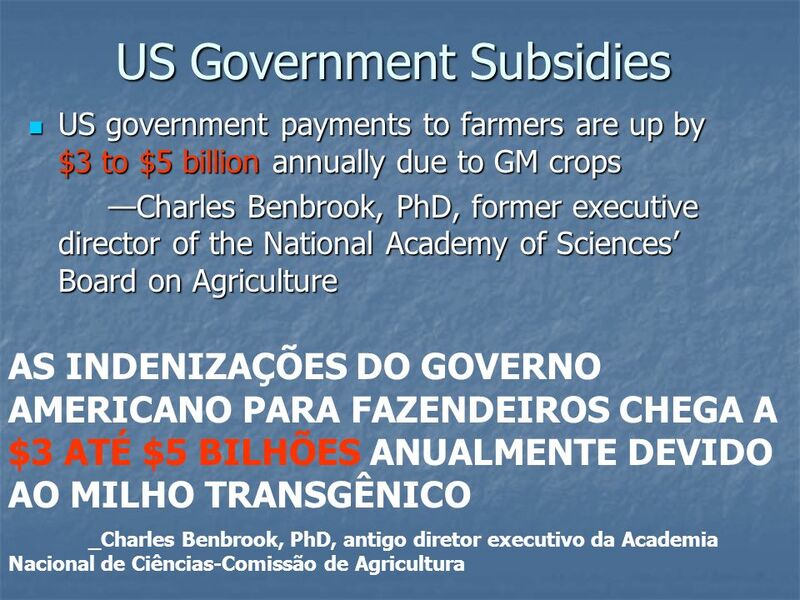 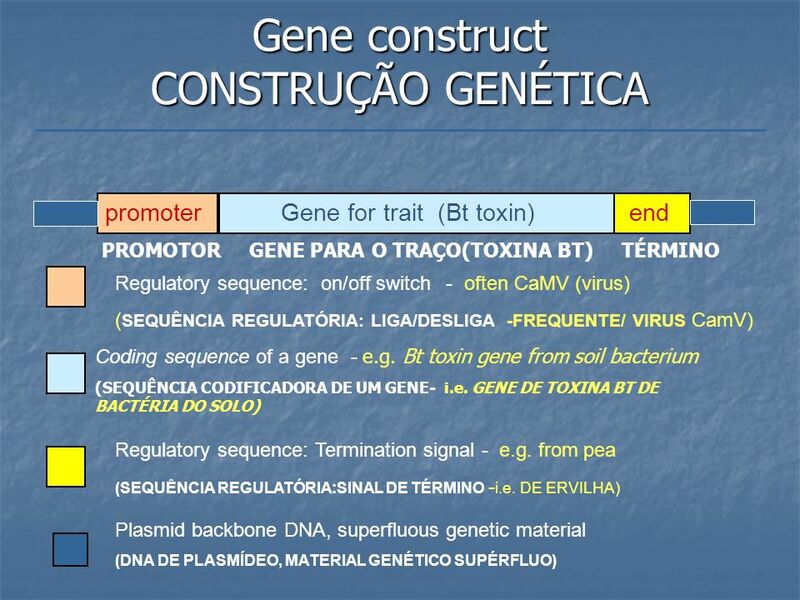 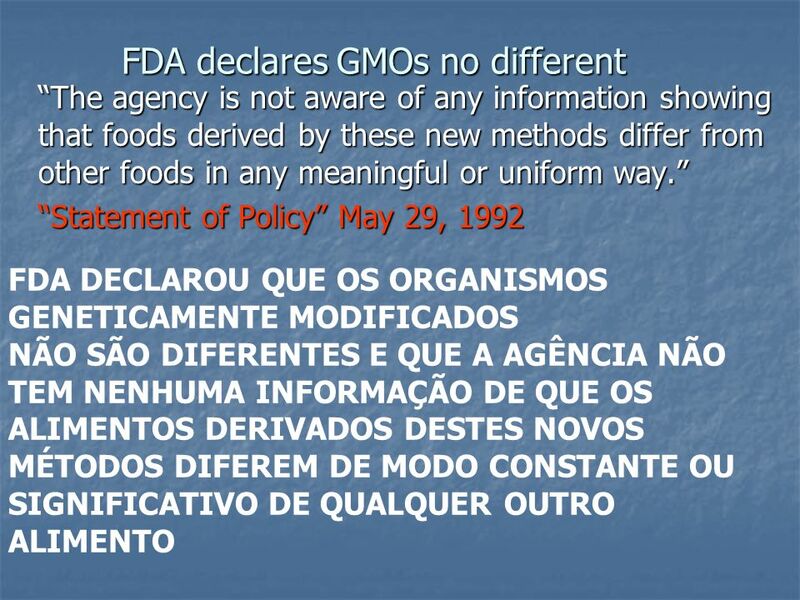 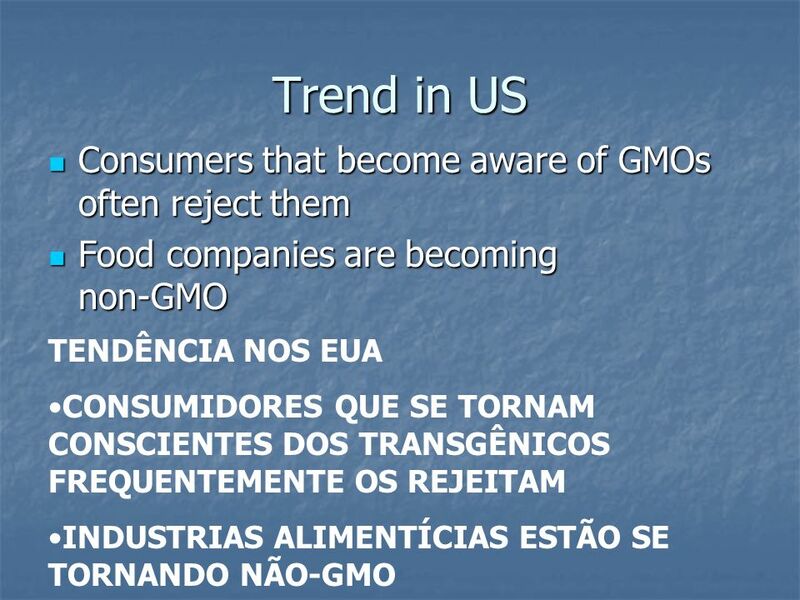 4 Initial plans for GMOs Industry’s goal was to genetically engineer and patent 100% of all commercial seeds in the world The US government’s goal was to increase US exports O OBJETIVO DA INDUSTRIA ERA MODIFICAR GENETICAMENTE E PATENTEAR 100% DE TODAS AS SEMENTES COMERCIAIS DO MUNDO. 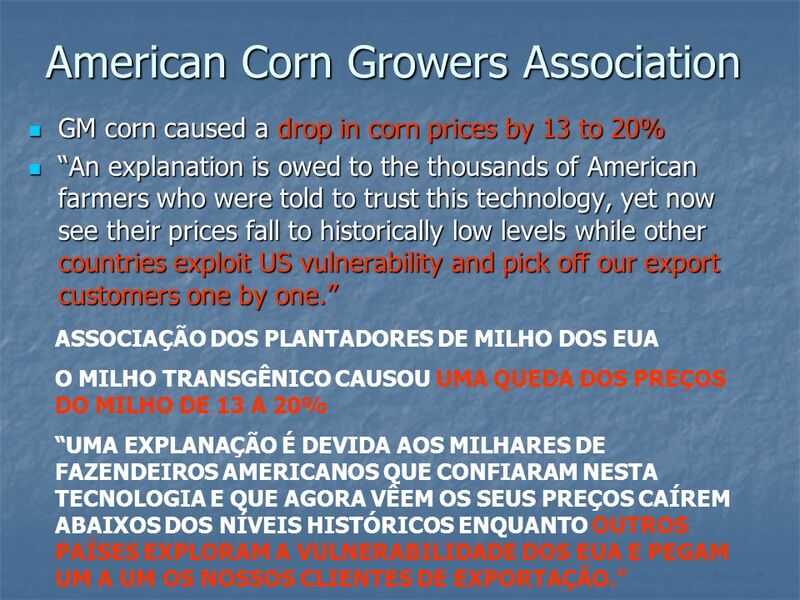 O OBJETIVO DO GOVERNO AMERICANO ERA AUMENTAR AS EXPORTACOES AMERICANAS. 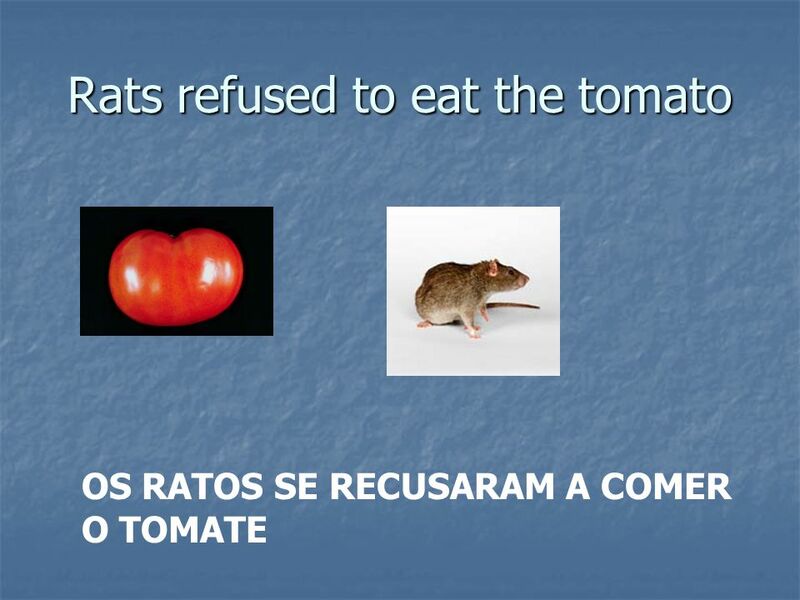 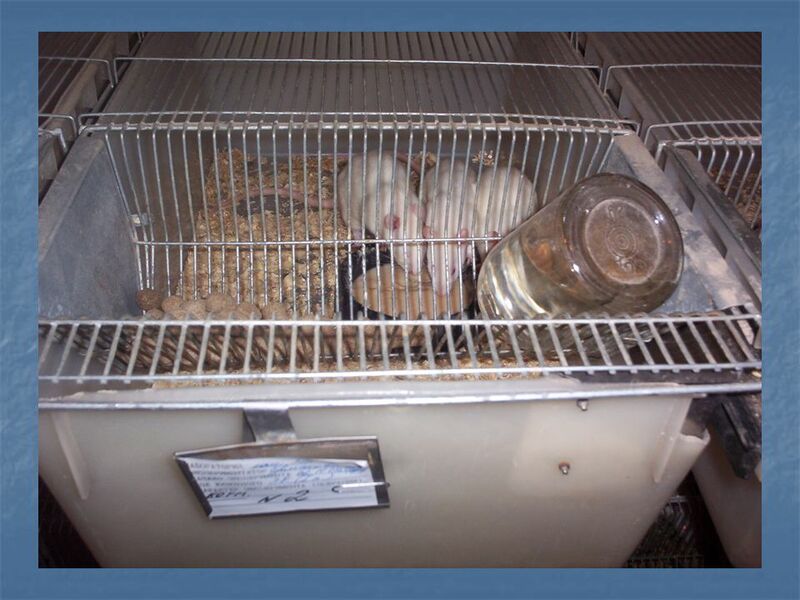 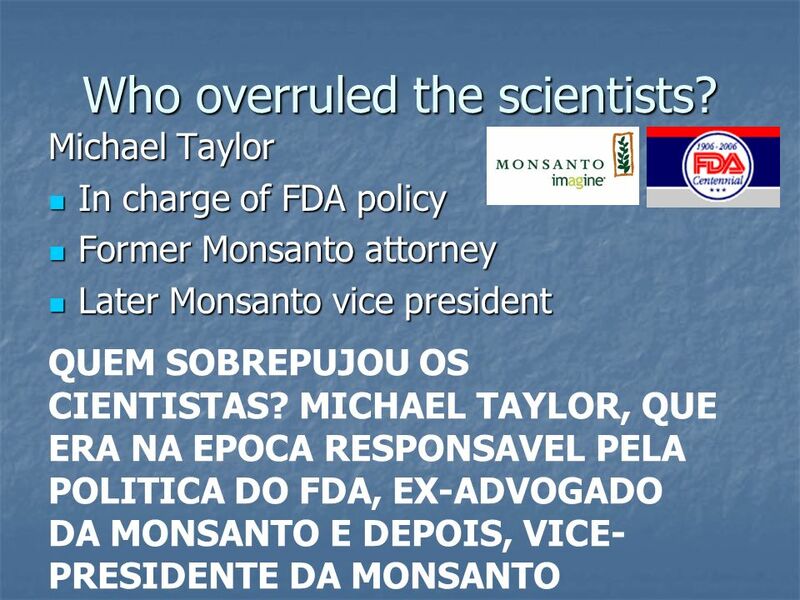 8 Who overruled the scientists? 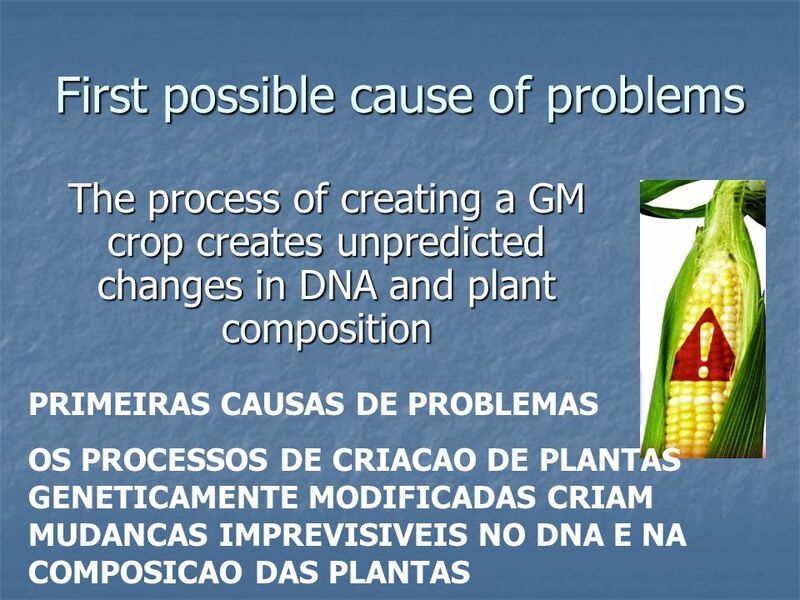 10 If GM crops are so bad, why don’t we see more problems? 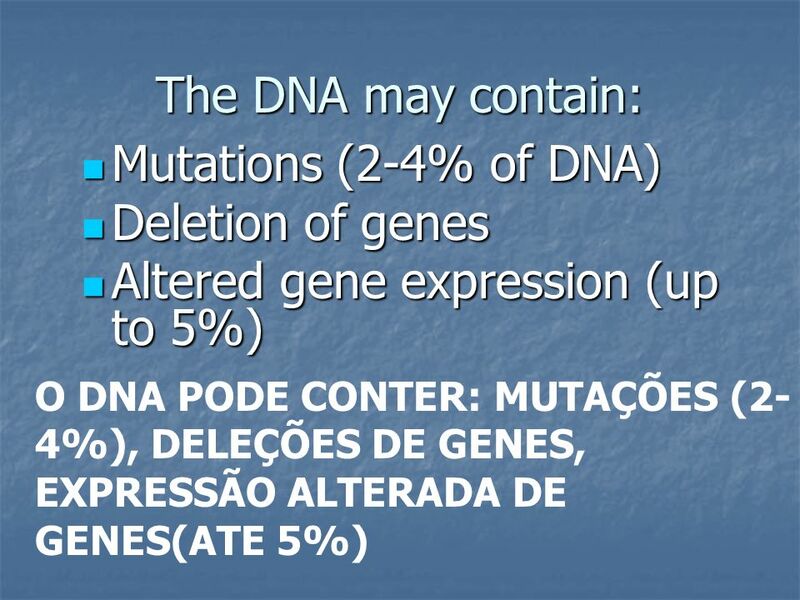 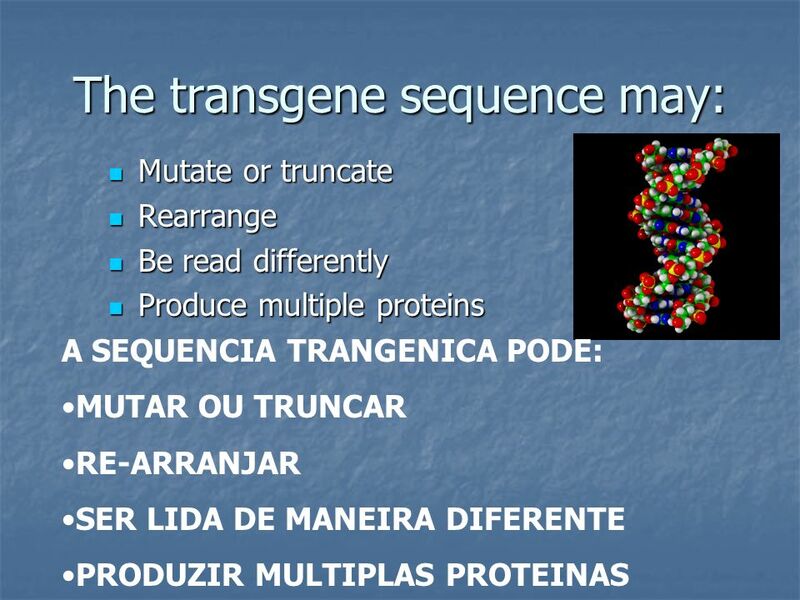 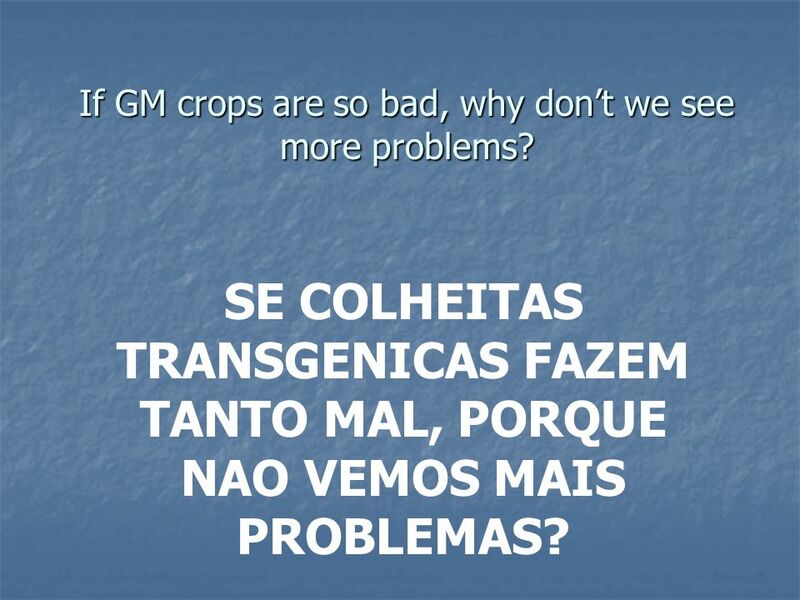 SE COLHEITAS TRANSGENICAS FAZEM TANTO MAL, PORQUE NAO VEMOS MAIS PROBLEMAS? 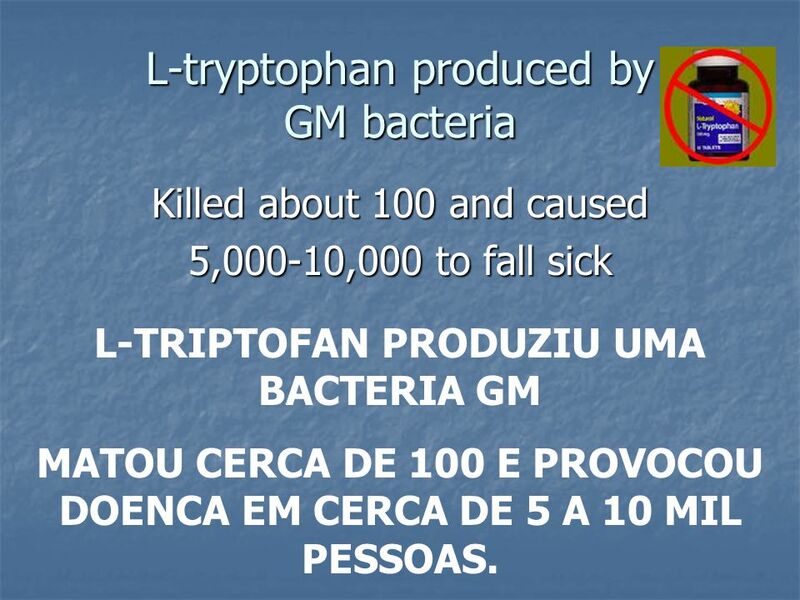 Killed about 100 and caused 5,000-10,000 to fall sick L-TRIPTOFAN PRODUZIU UMA BACTERIA GM MATOU CERCA DE 100 E PROVOCOU DOENCA EM CERCA DE 5 A 10 MIL PESSOAS. 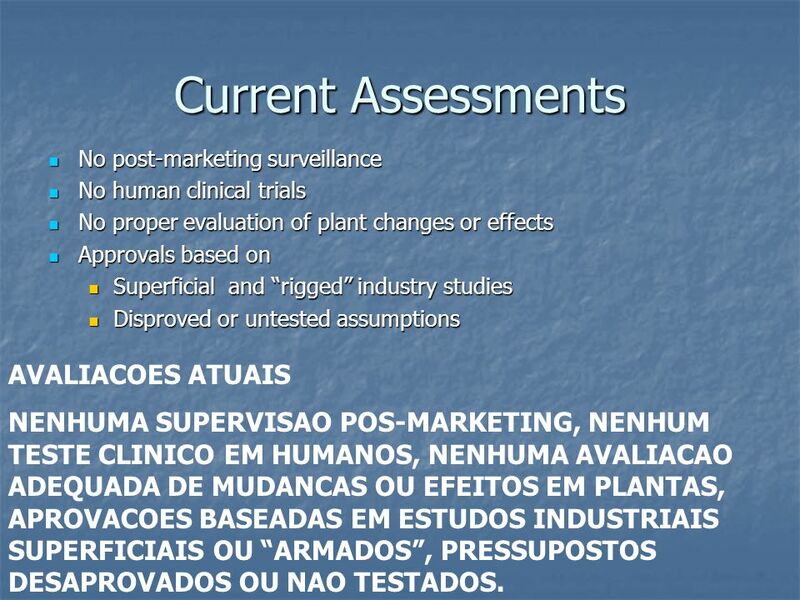 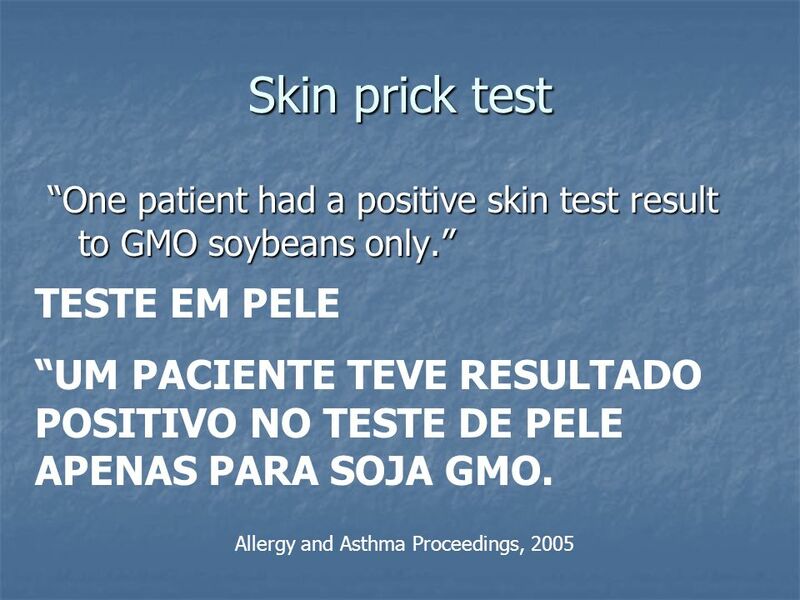 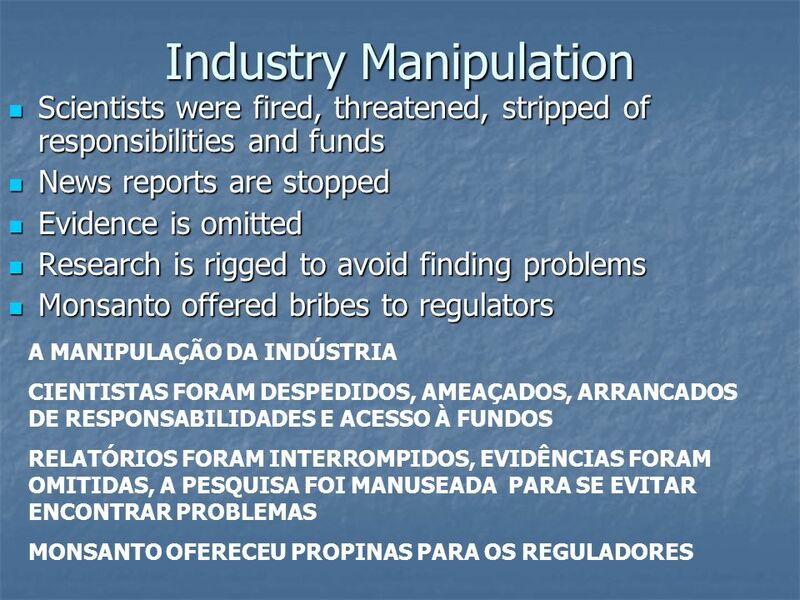 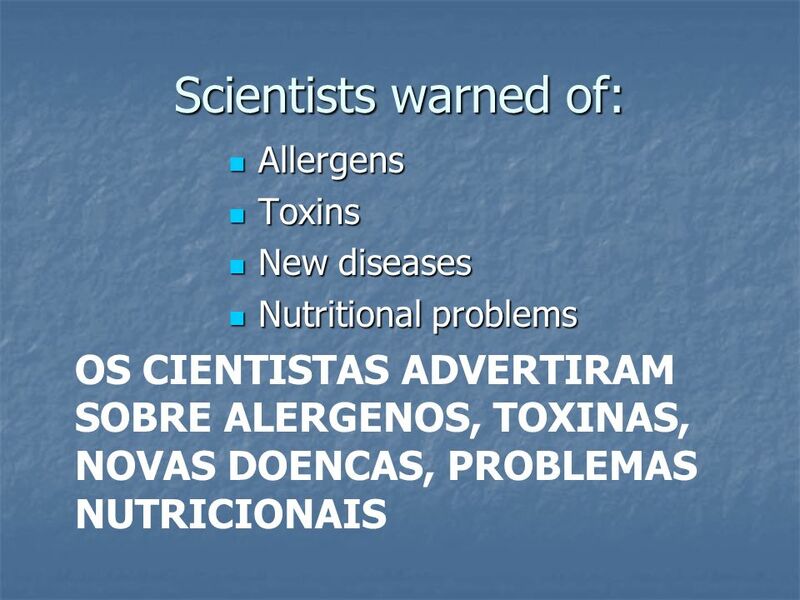 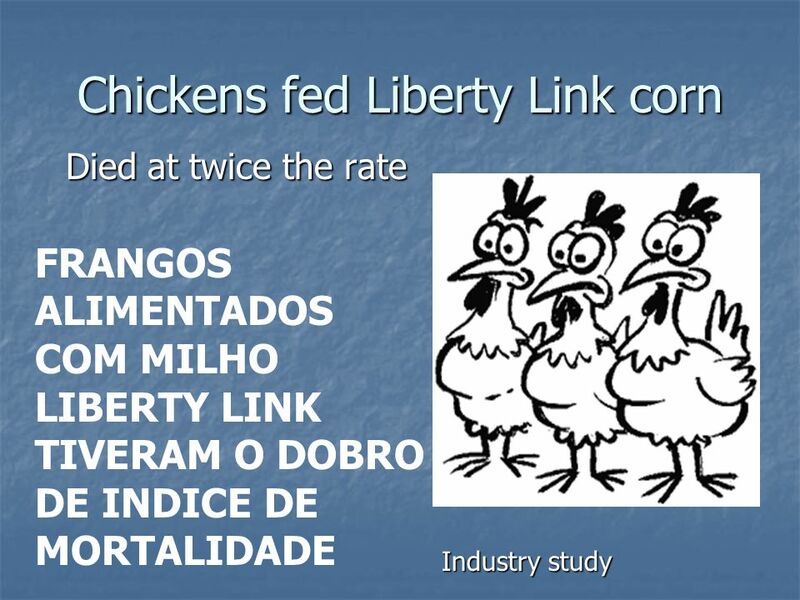 No post-marketing surveillance No human clinical trials No proper evaluation of plant changes or effects Approvals based on Superficial and “rigged” industry studies Disproved or untested assumptions AVALIACOES ATUAIS NENHUMA SUPERVISAO POS-MARKETING, NENHUM TESTE CLINICO EM HUMANOS, NENHUMA AVALIACAO ADEQUADA DE MUDANCAS OU EFEITOS EM PLANTAS, APROVACOES BASEADAS EM ESTUDOS INDUSTRIAIS SUPERFICIAIS OU “ARMADOS”, PRESSUPOSTOS DESAPROVADOS OU NAO TESTADOS. 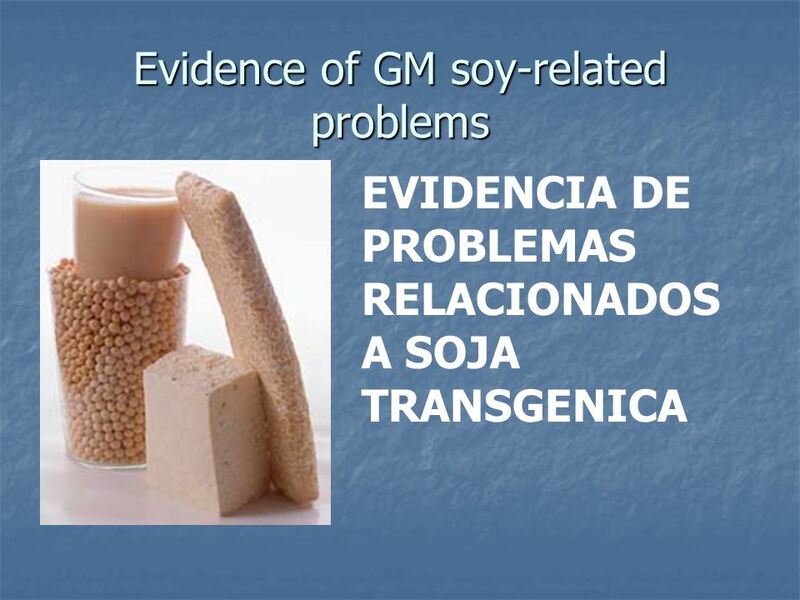 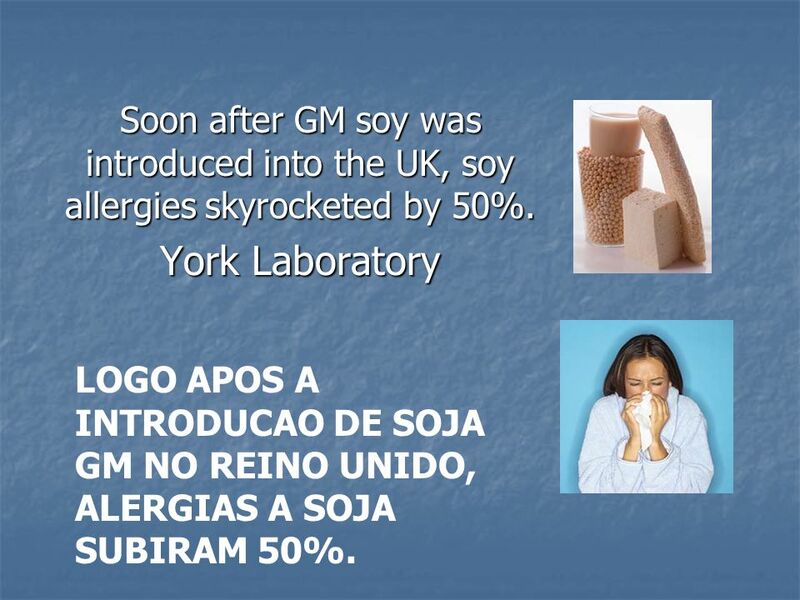 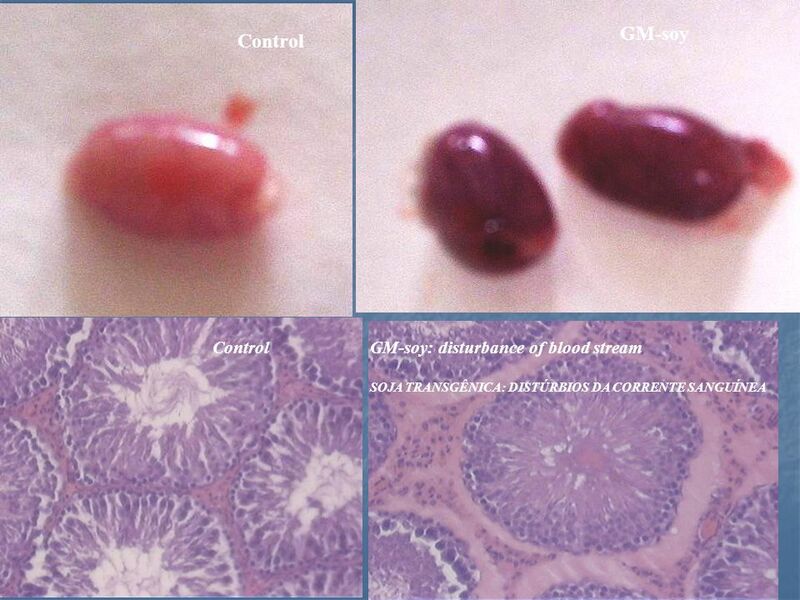 15 Soon after GM soy was introduced into the UK, soy allergies skyrocketed by 50%. 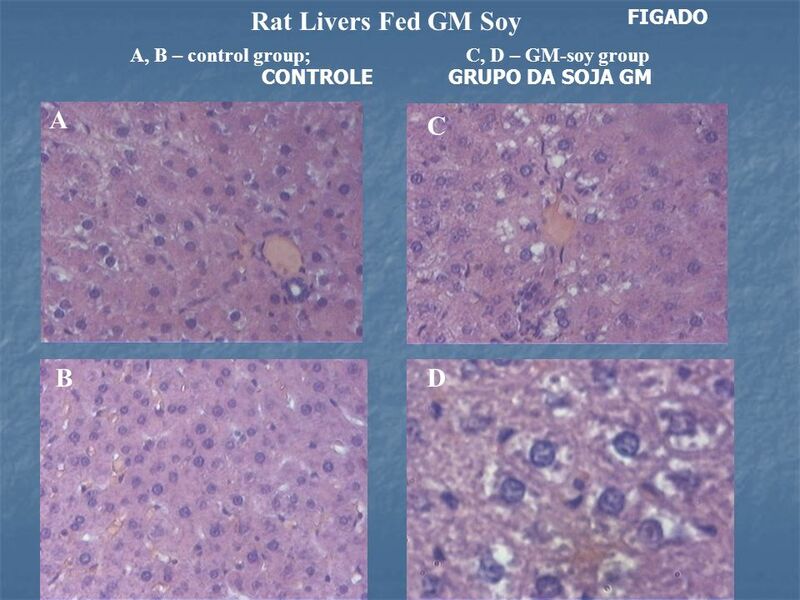 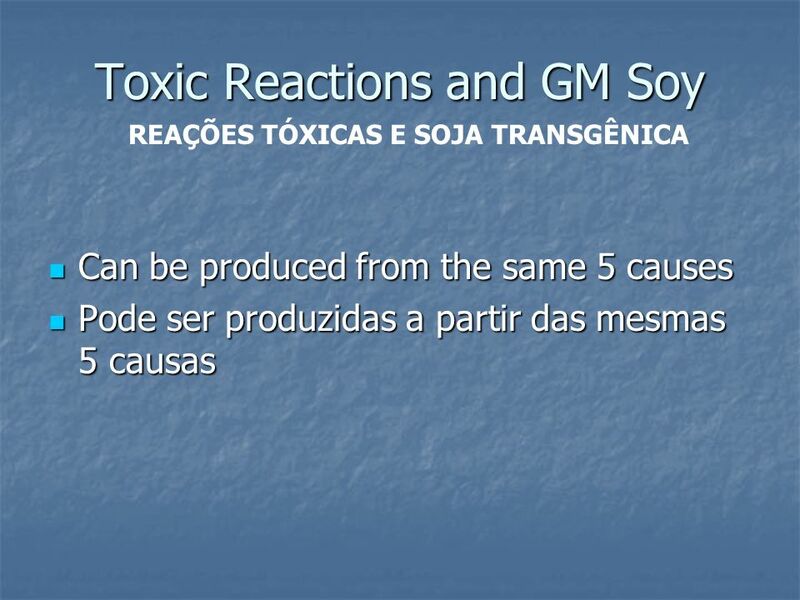 York Laboratory LOGO APOS A INTRODUCAO DE SOJA GM NO REINO UNIDO, ALERGIAS A SOJA SUBIRAM 50%. 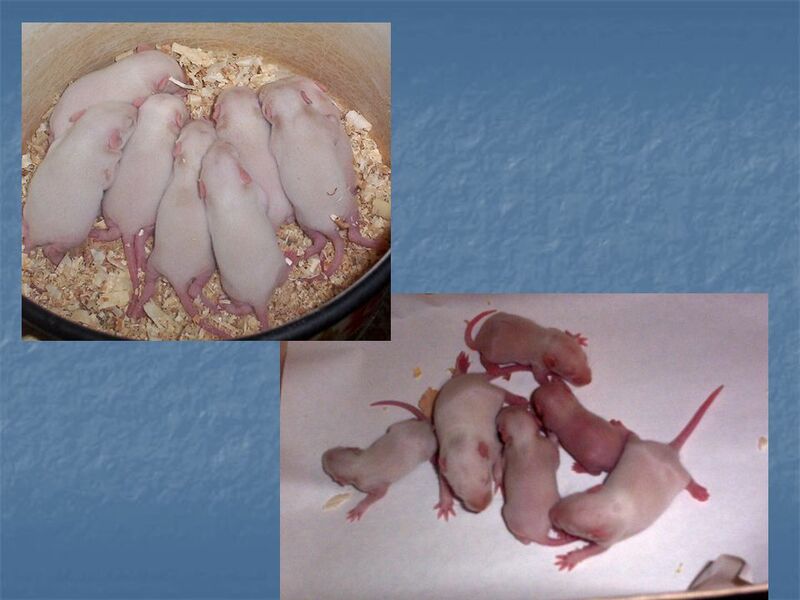 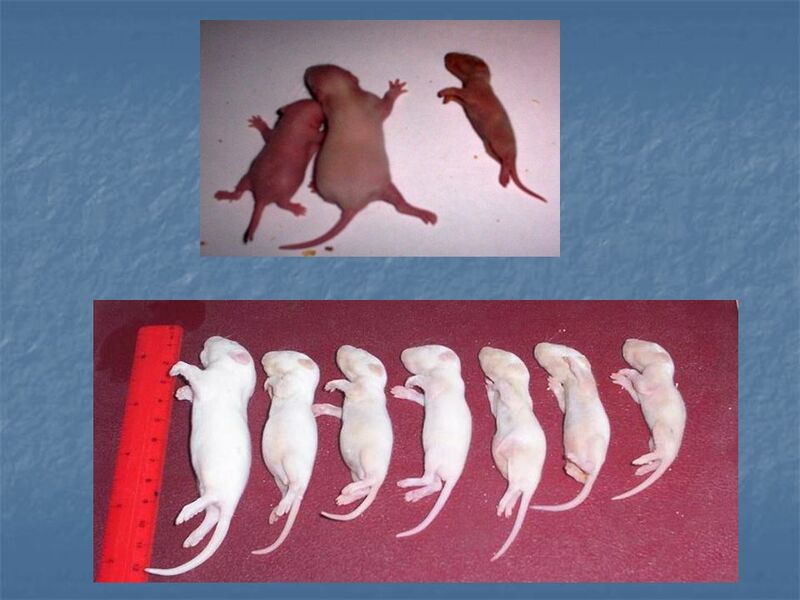 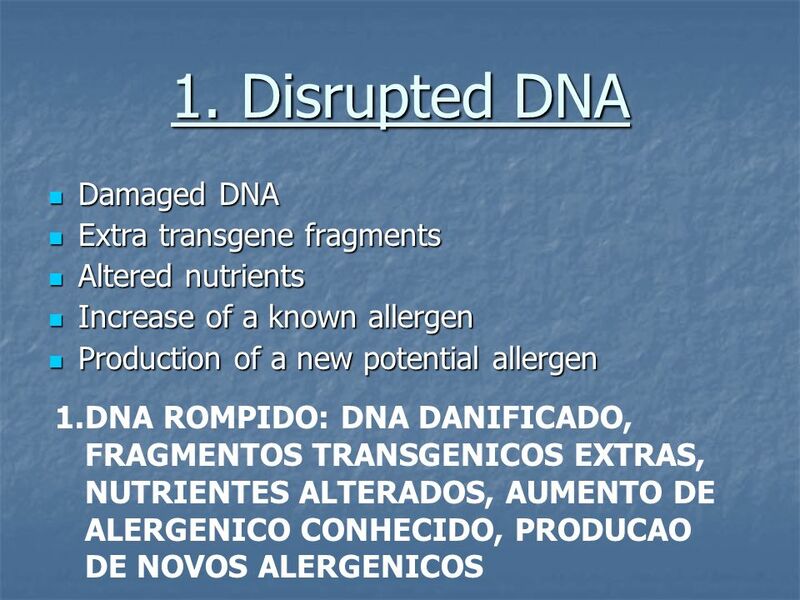 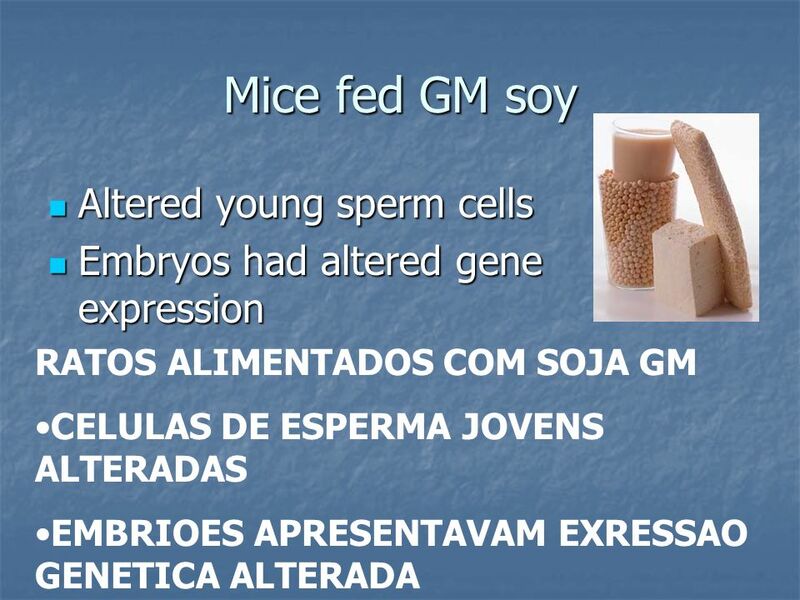 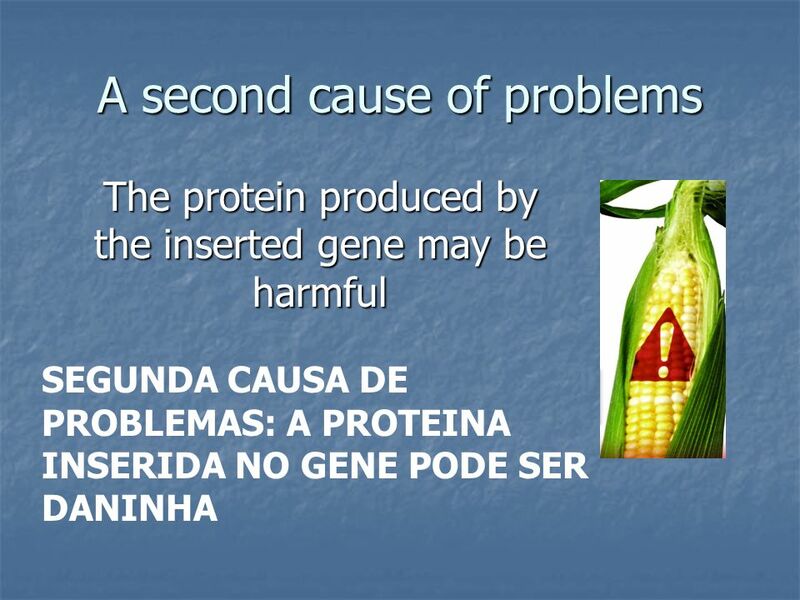 16 Could genetic engineering cause such problems? 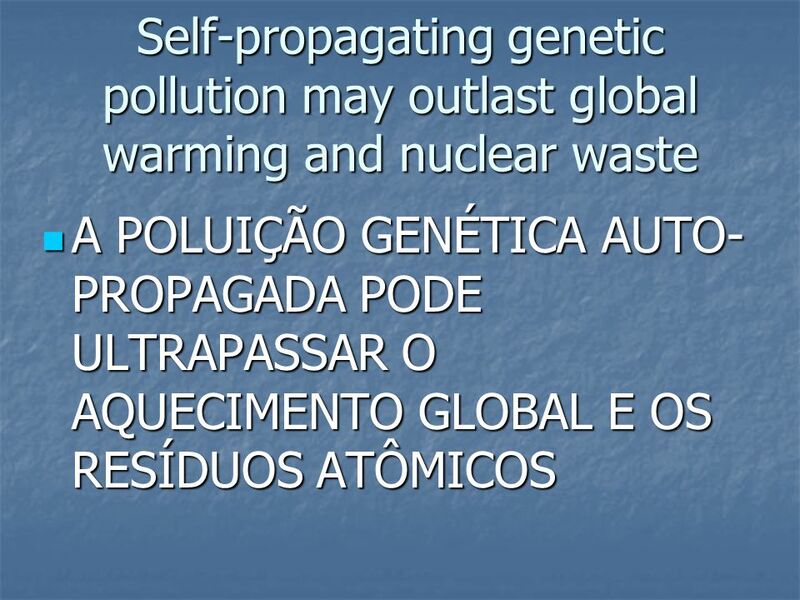 SERÁ QUE A ENGENHARIA GENÉTICA PODERIA CAUSAR TAIS PROBLEMAS? 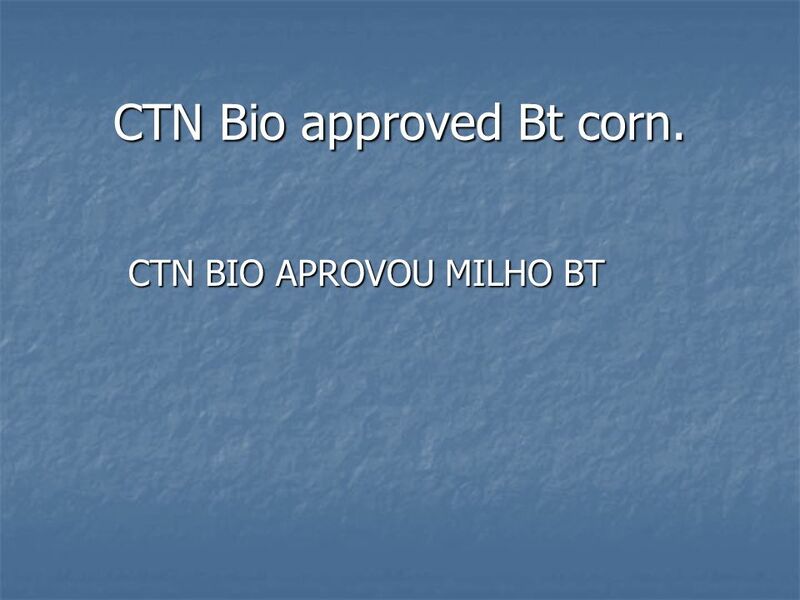 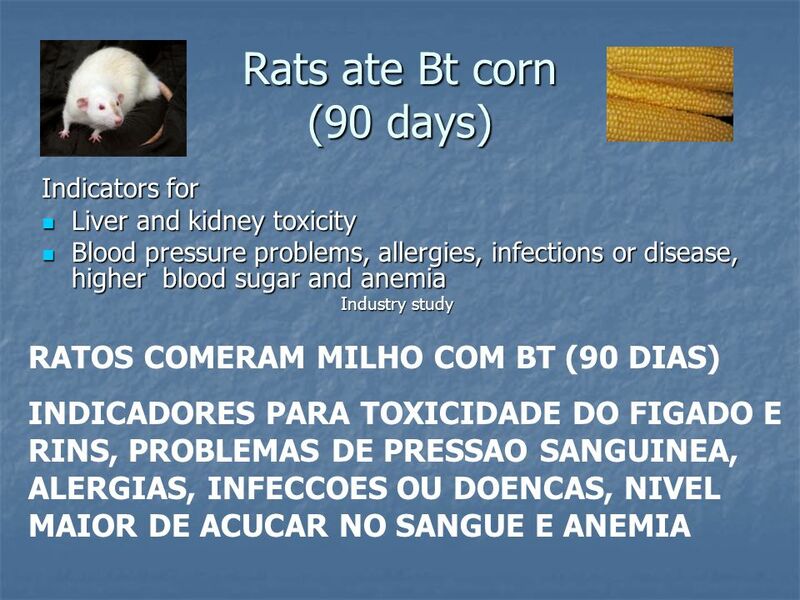 48 CTN Bio approved Bt corn. 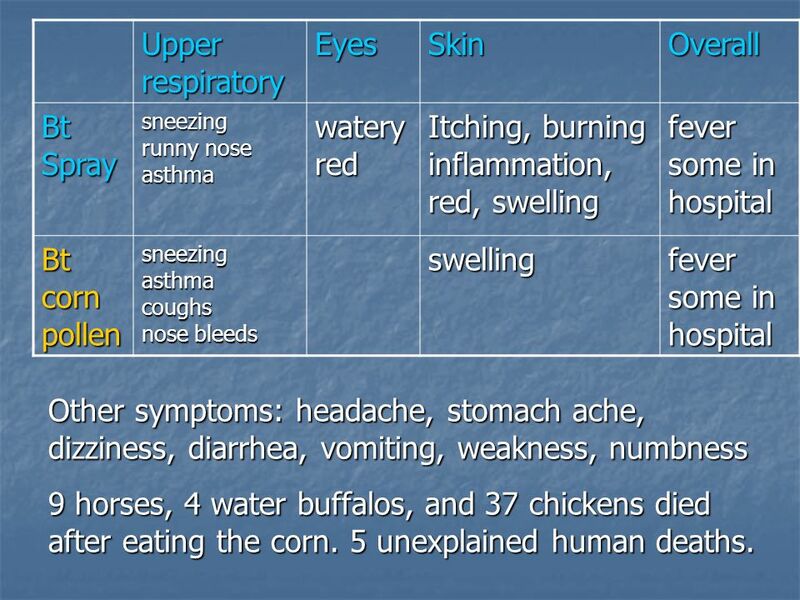 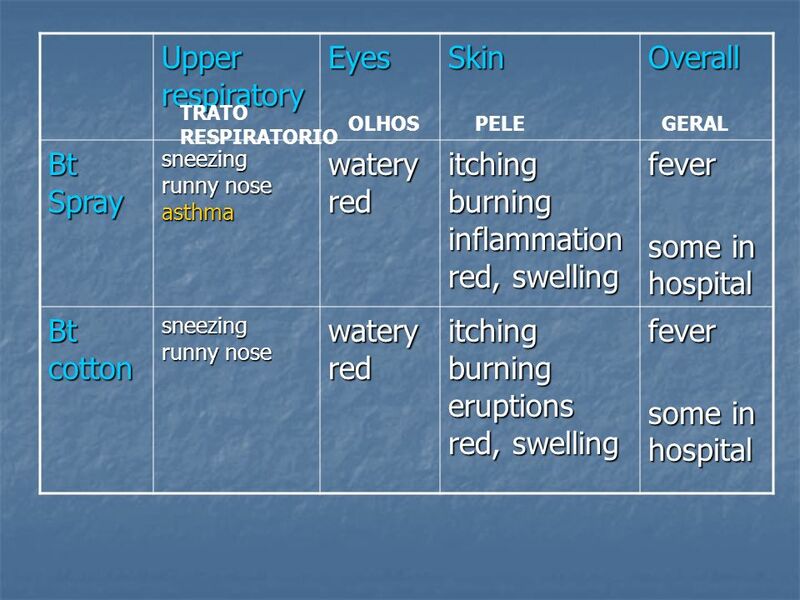 Upper respiratory Eyes Skin Overall Bt Spray sneezing runny nose asthma watery red Itching, burning inflammation, red, swelling fever some in hospital Bt corn pollen sneezing asthma coughs nose bleeds swelling Other symptoms: headache, stomach ache, dizziness, diarrhea, vomiting, weakness, numbness 9 horses, 4 water buffalos, and 37 chickens died after eating the corn. 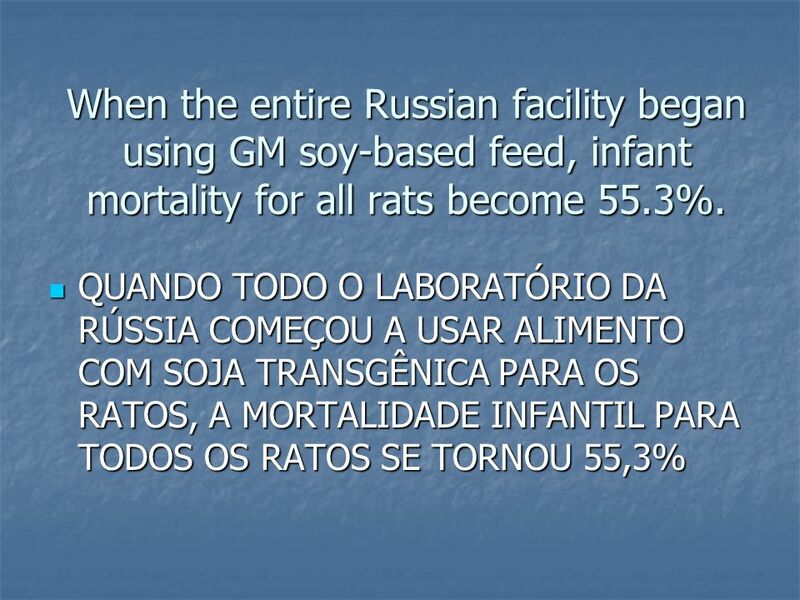 5 unexplained human deaths. 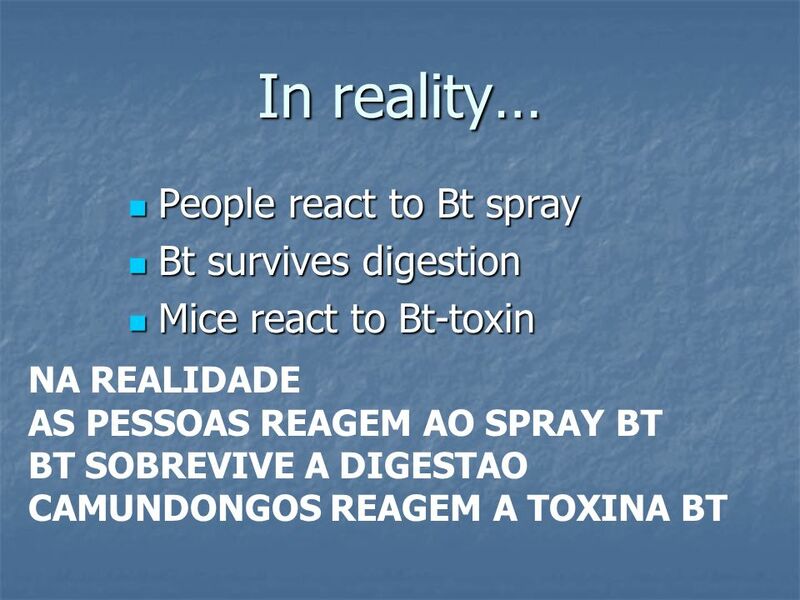 Trato Respiratório Olhos Pele Geral Bt Spray Espirros Nariz escorrendo asma Lacri-mejando vermelho coceiras, inflamações, vermelhidão, inchaços Febre, hospitalizações Bt polem de milho Espirros, asma, tosse, hemorragias nasais inchaços Outros sintomas: dor de cabeça, cólicas, tonturas, diarréias, vômitos, fraqueza, adormecimentos 9 cavalos, 4 búfallos, e 37 galinhas morreram depois de comer o milho. 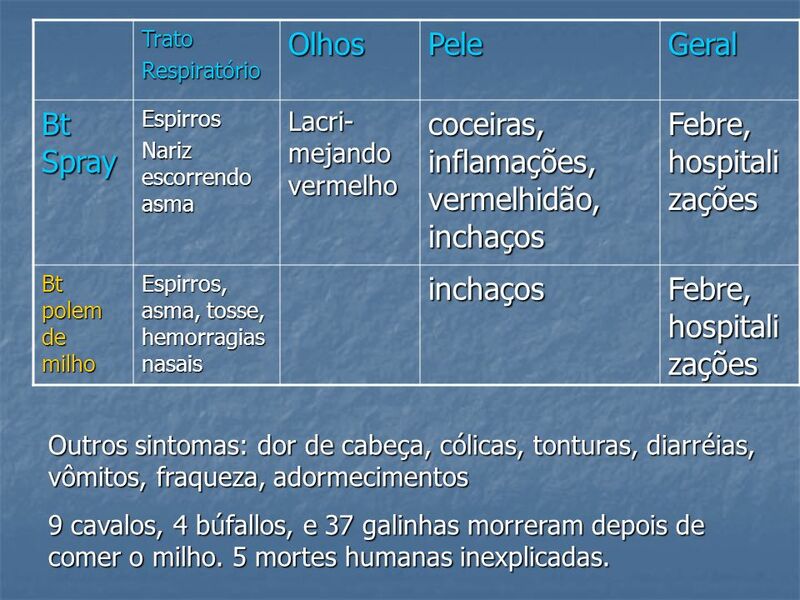 5 mortes humanas inexplicadas. 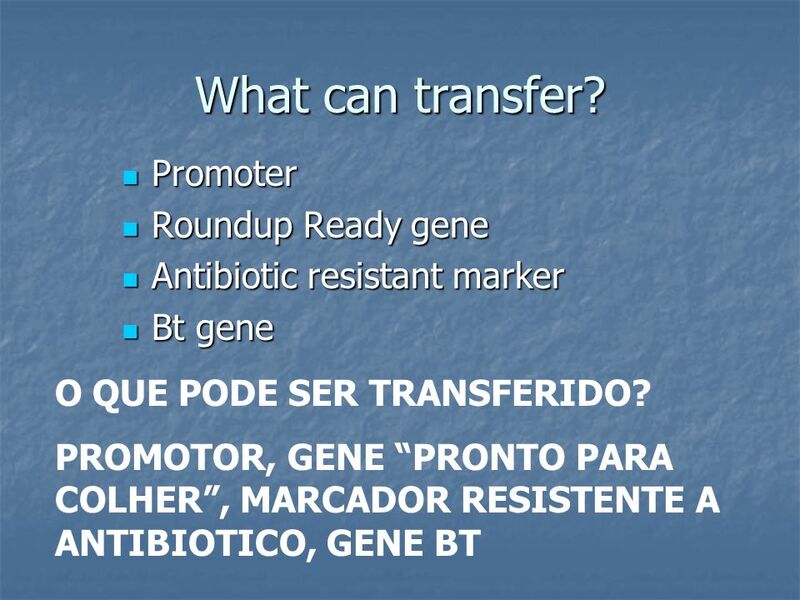 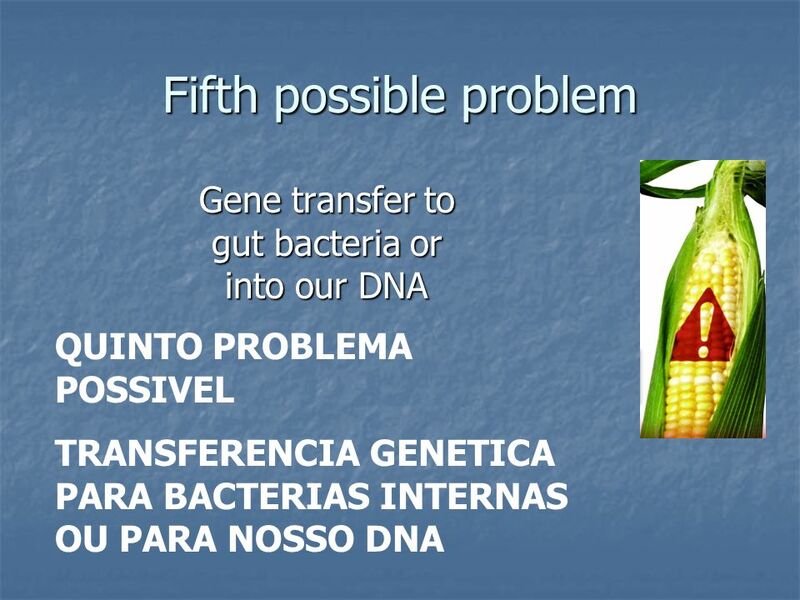 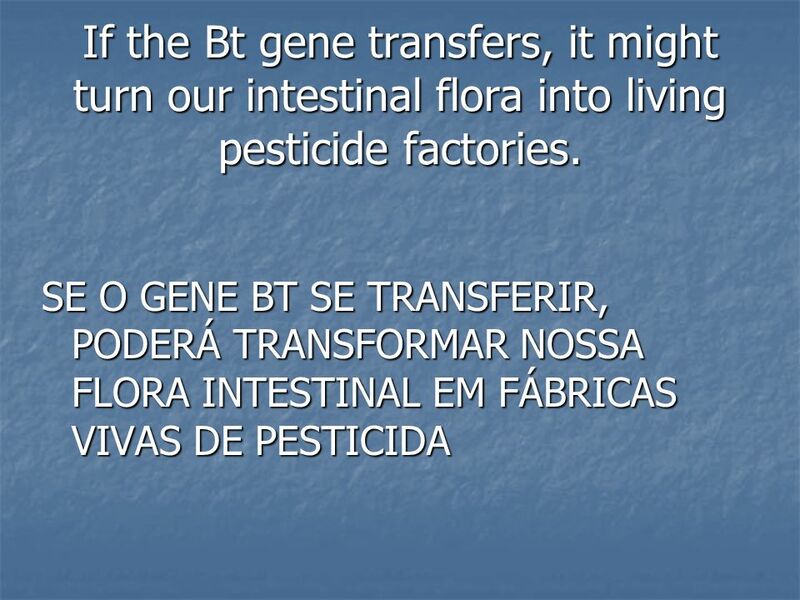 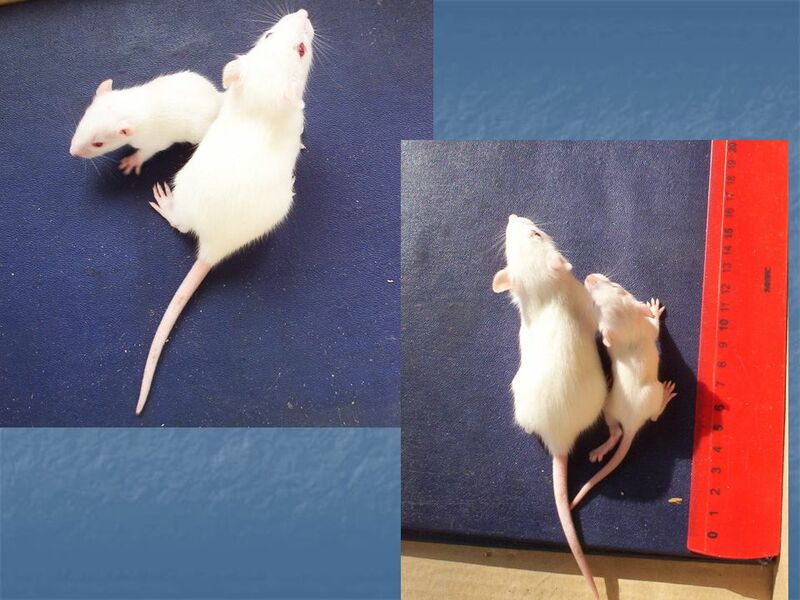 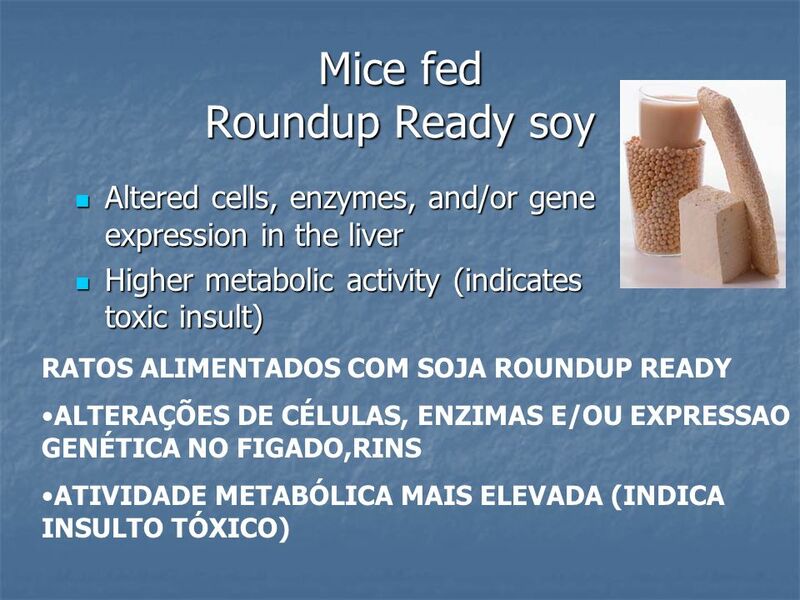 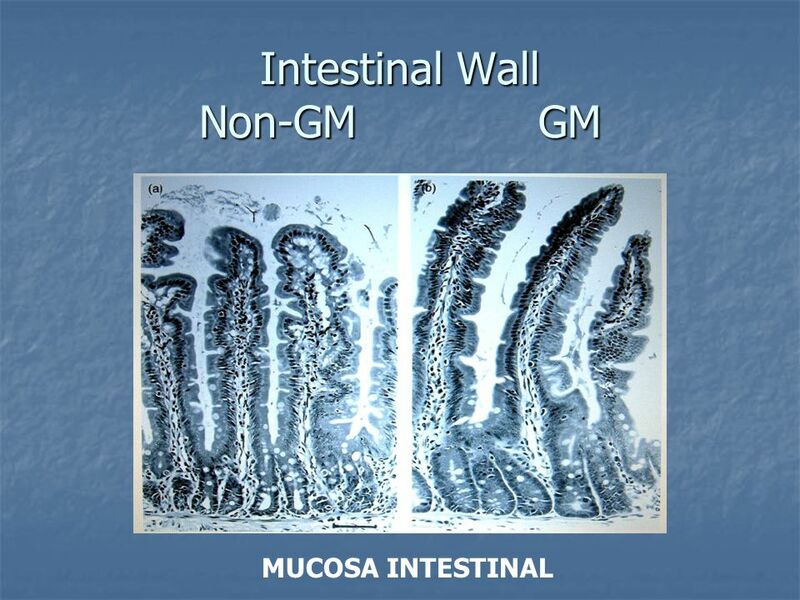 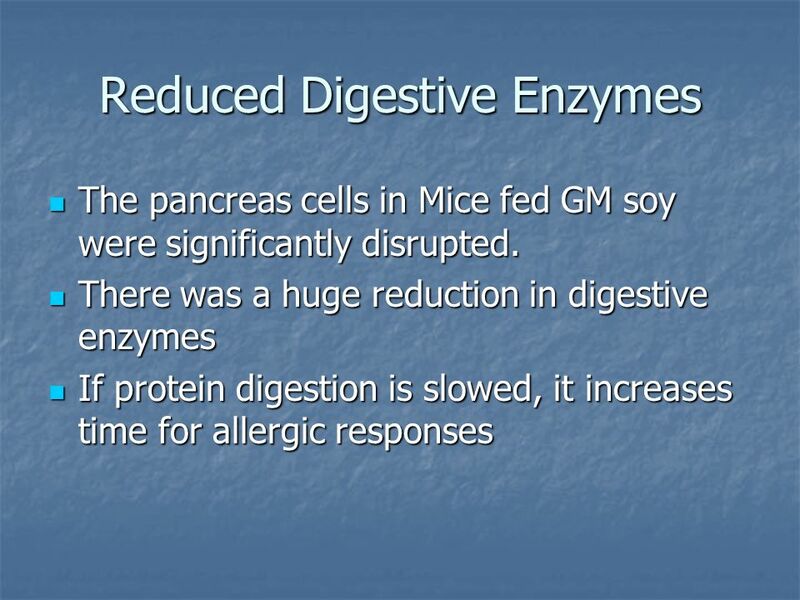 63 If the Bt gene transfers, it might turn our intestinal flora into living pesticide factories. 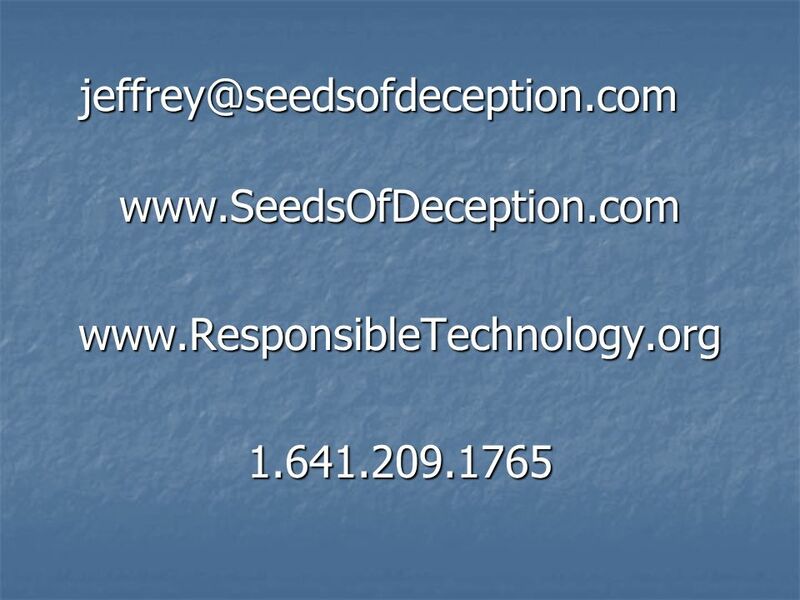 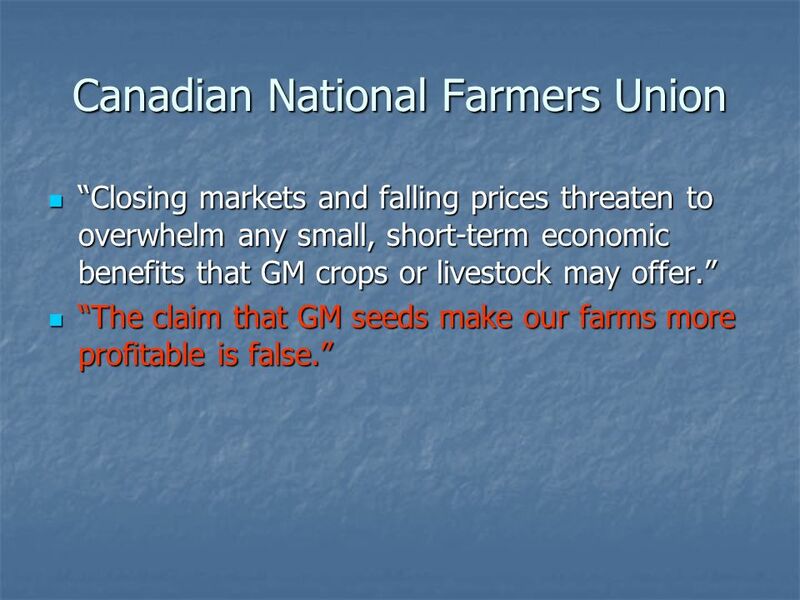 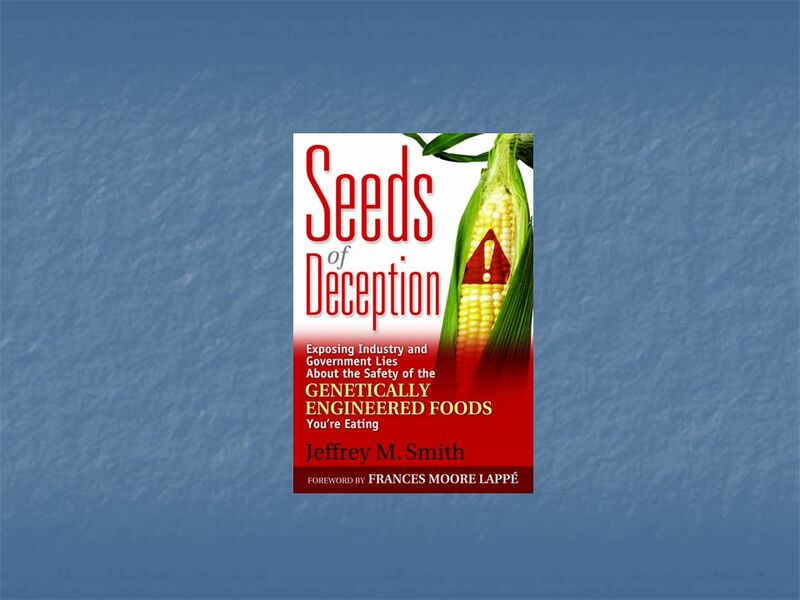 “Corporate and government managers have spent millions trying to convince farmers and other citizens of the benefits of genetically-modified (GM) crops. 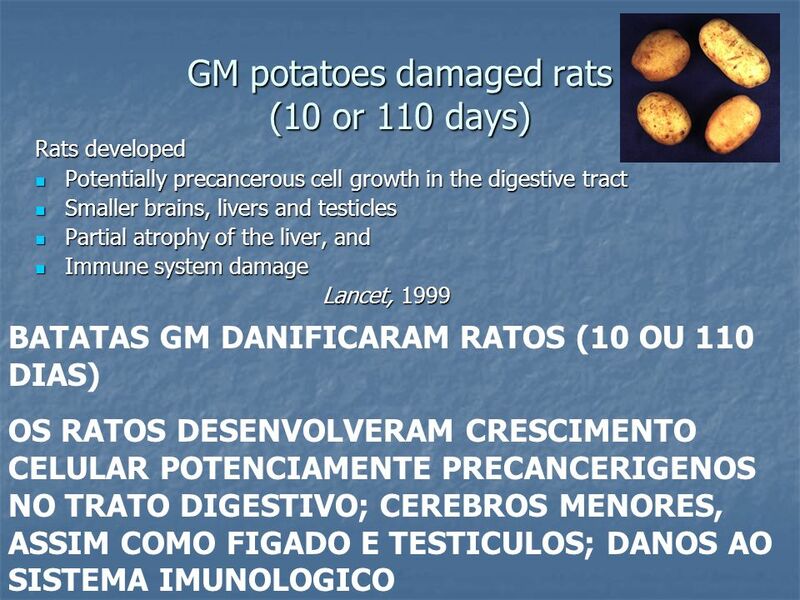 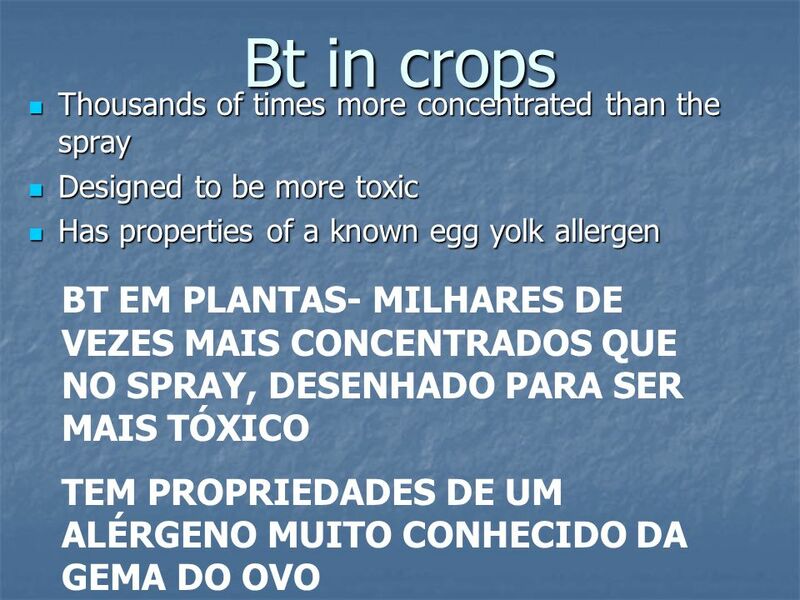 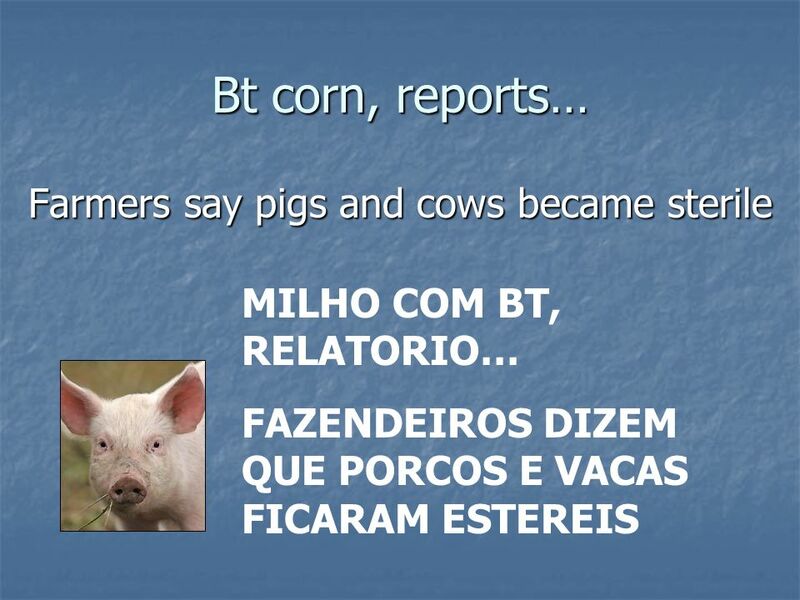 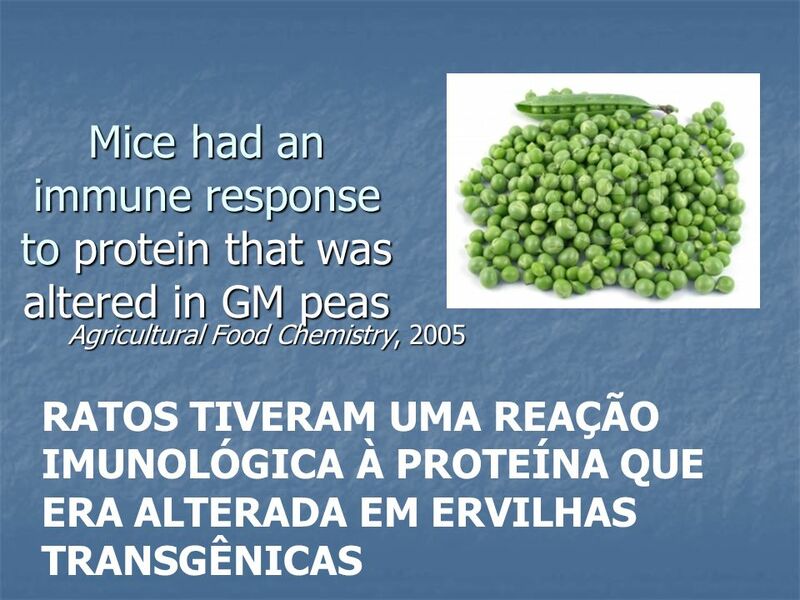 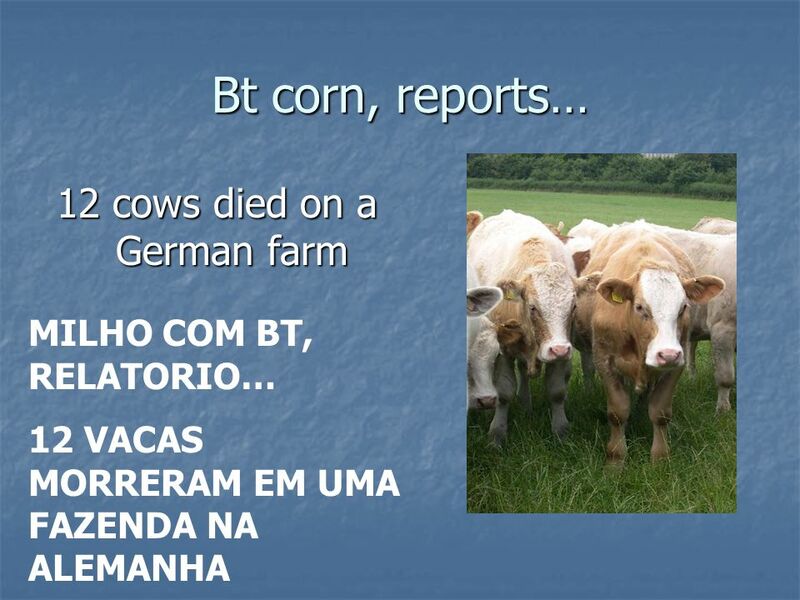 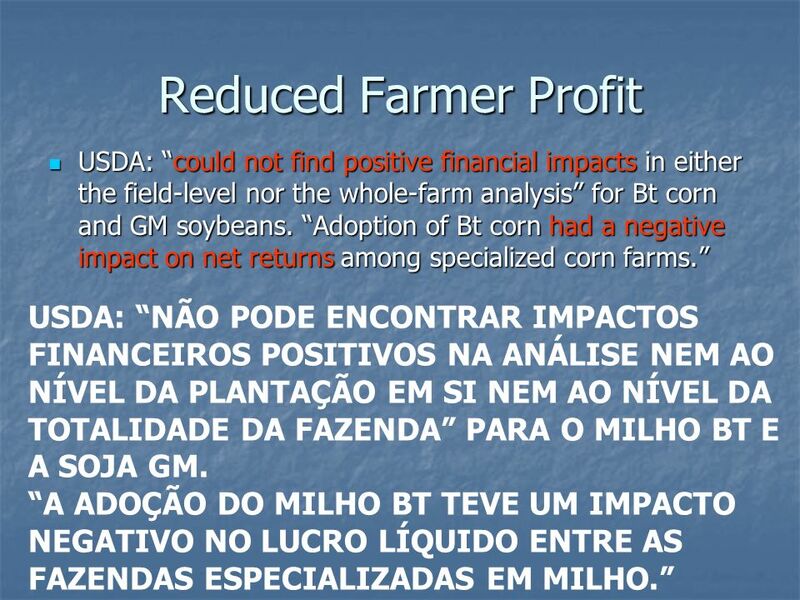 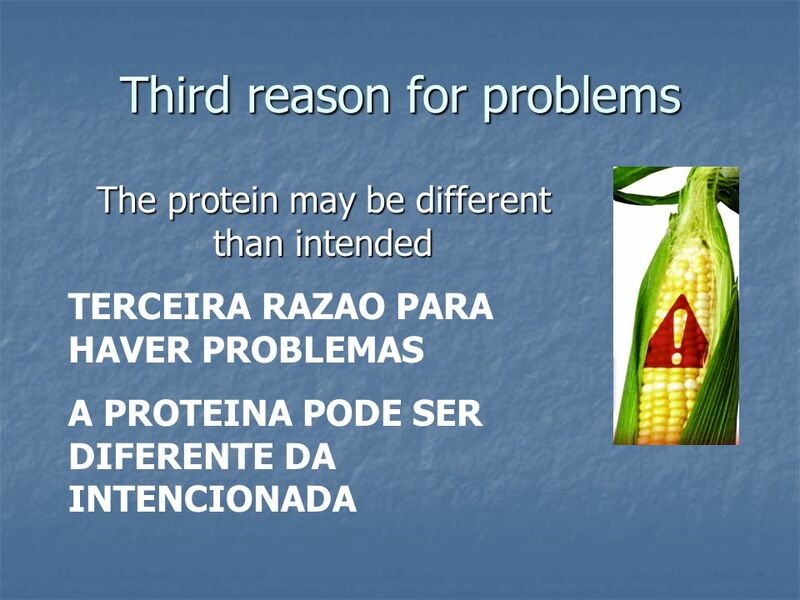 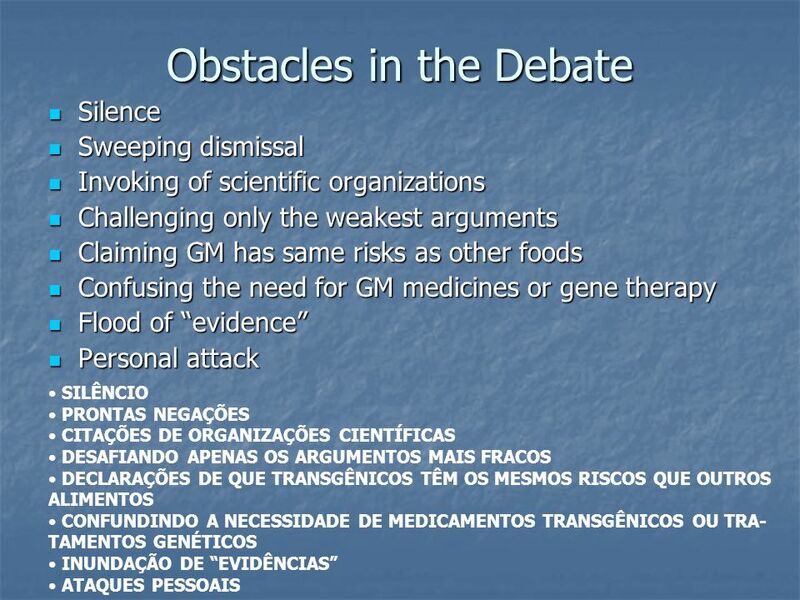 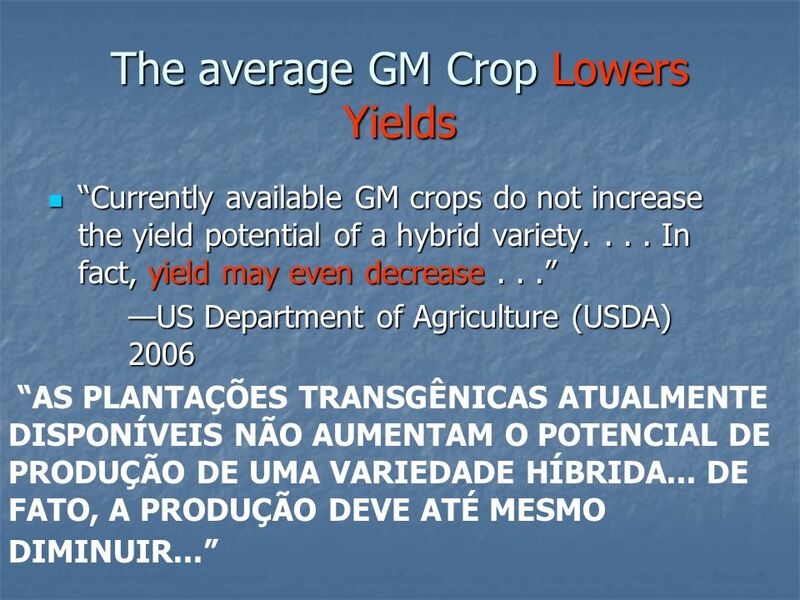 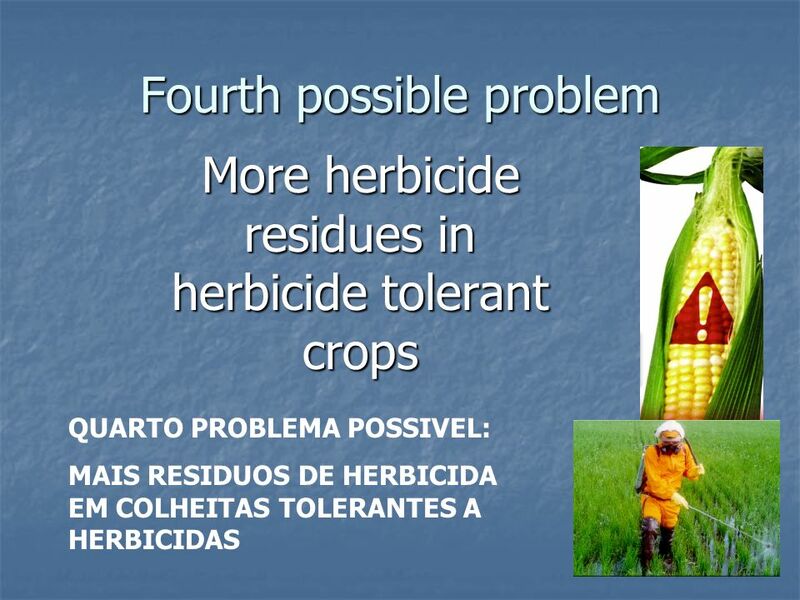 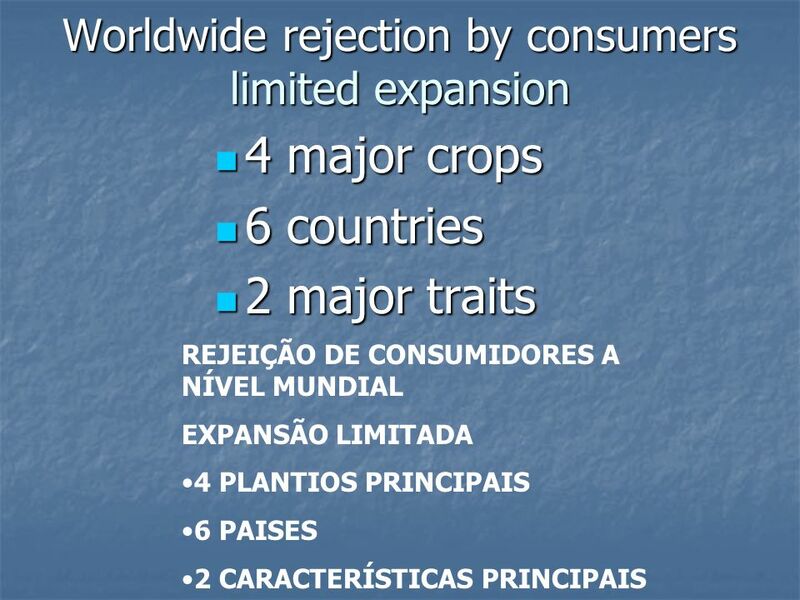 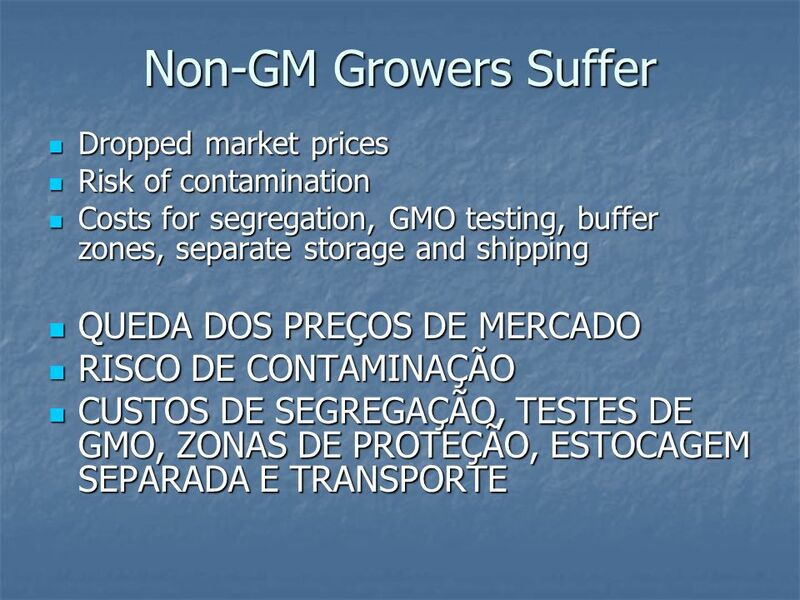 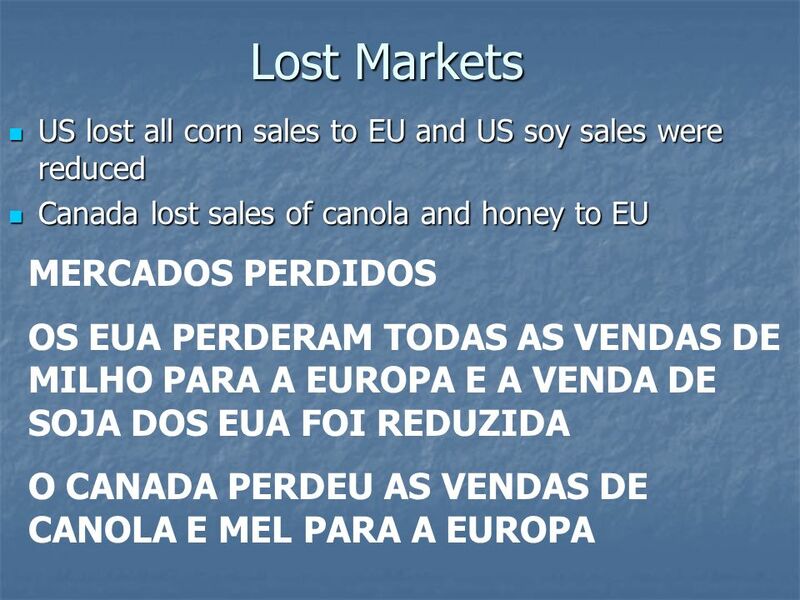 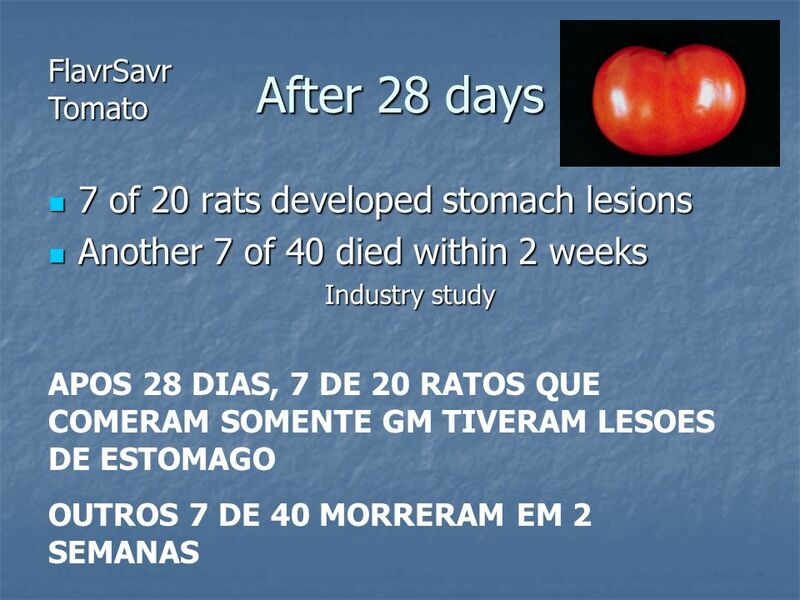 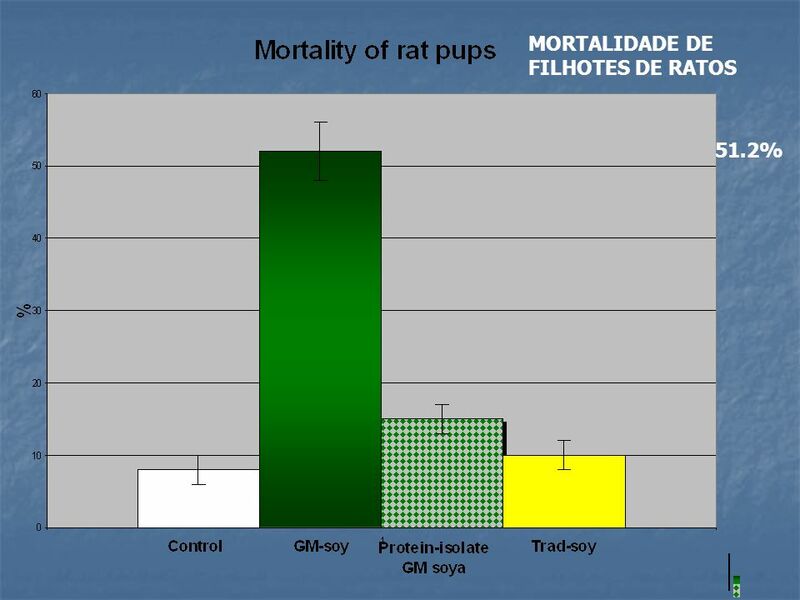 But this huge public relations effort has failed to obscure the truth: GM crops do not deliver the promised benefits.” “ADMINISTRADORES DE EMPRESA E GOVERNO TÊM GASTO MILHÕES TENTANDO CONVENCER FAZENDEIROS E OUTROS CIDADÕES DOS BENEFÍCIOS DAS PLANTAÇÕES TRANSGÊNICAS (GM). 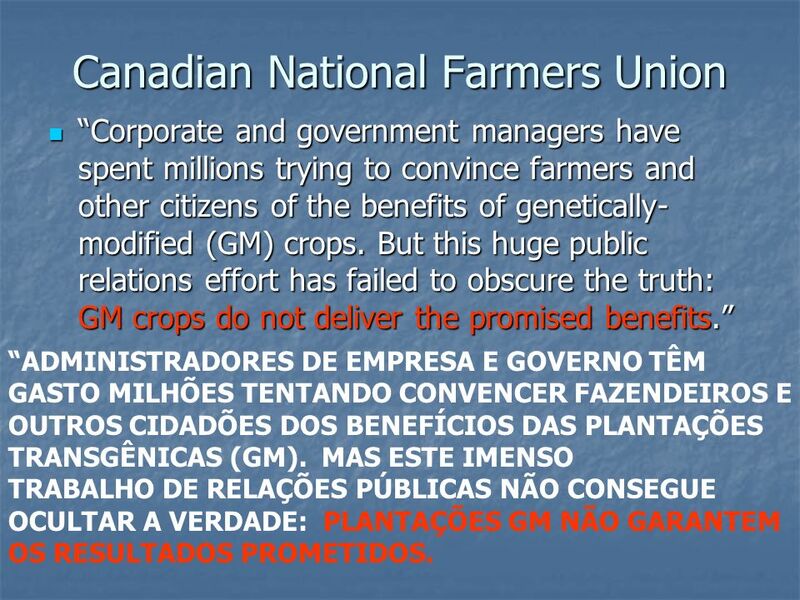 MAS ESTE IMENSO TRABALHO DE RELAÇÕES PÚBLICAS NÃO CONSEGUE OCULTAR A VERDADE: PLANTAÇÕES GM NÃO GARANTEM OS RESULTADOS PROMETIDOS. 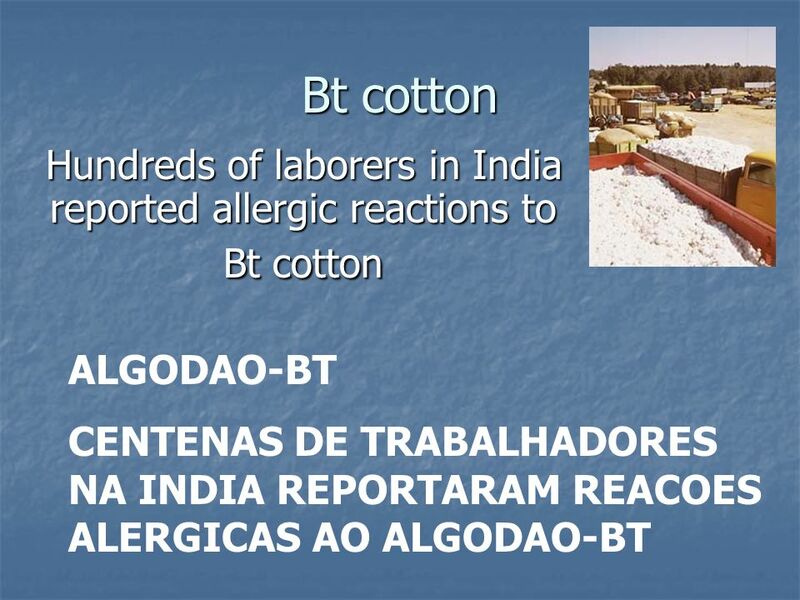 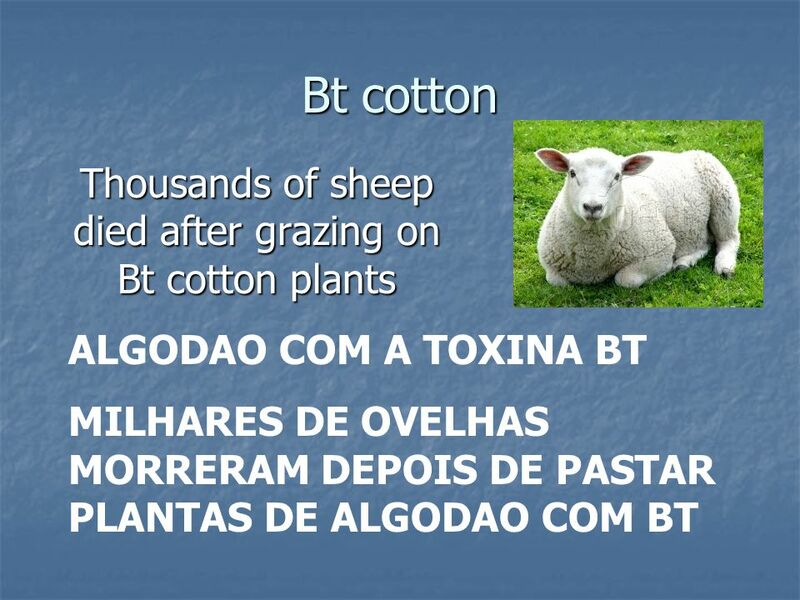 80 Reduced Farmer Profit By 2004, Bt cotton farmers in China earn significantly less than non-Bt farmers. 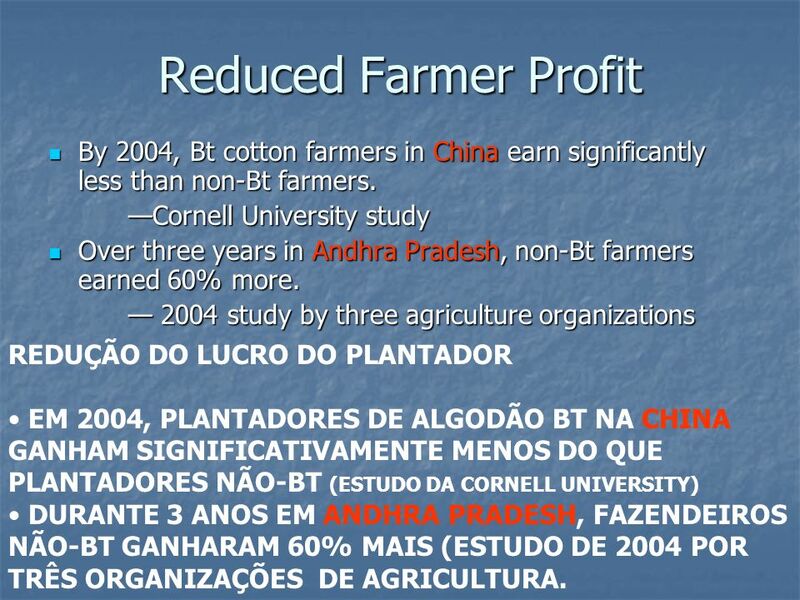 —Cornell University study Over three years in Andhra Pradesh, non-Bt farmers earned 60% more. 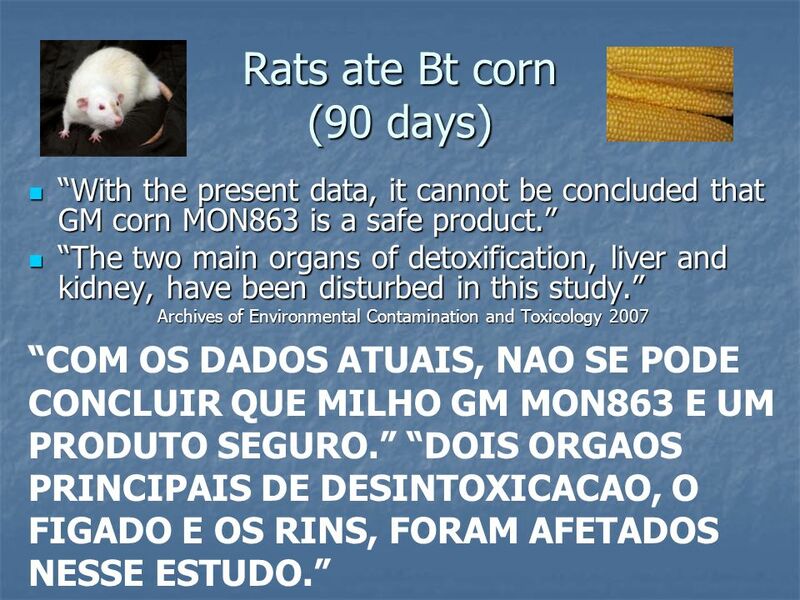 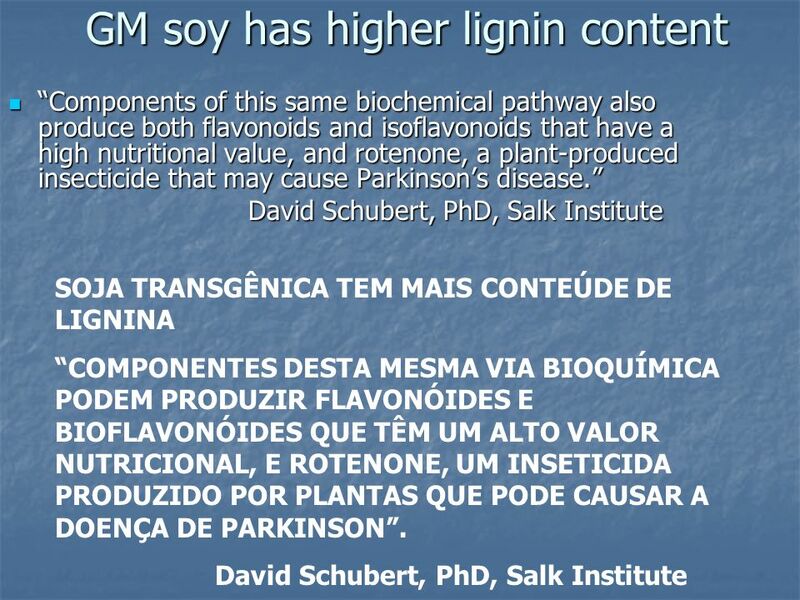 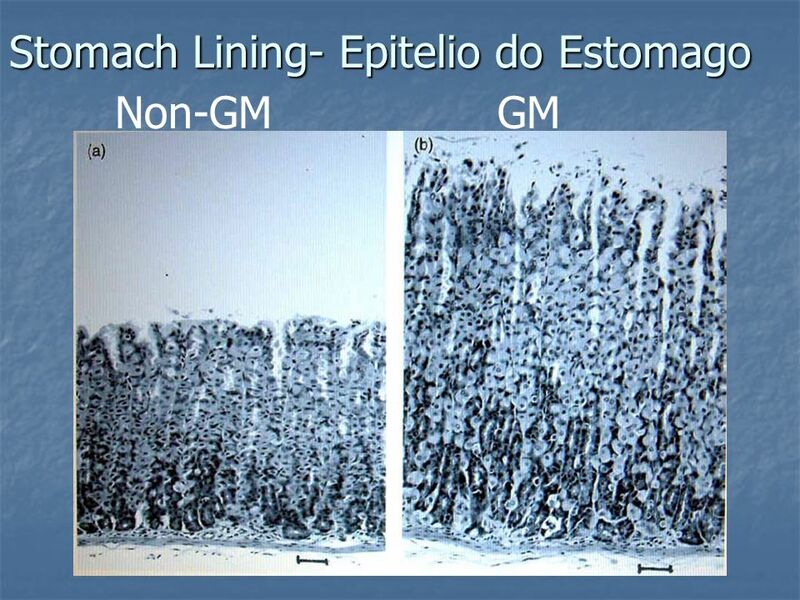 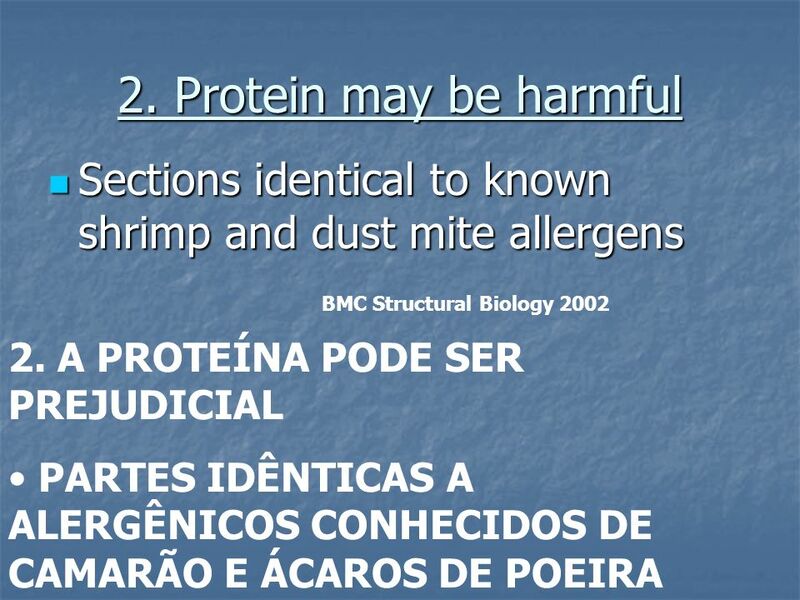 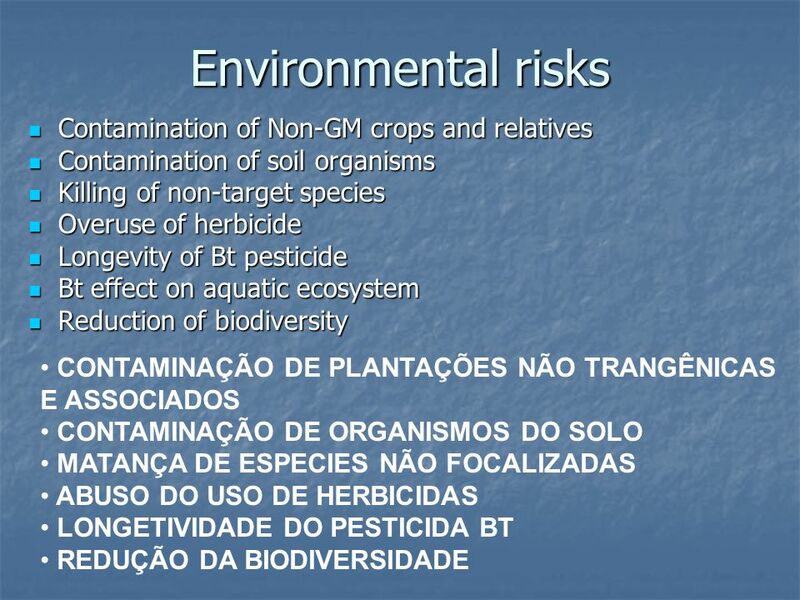 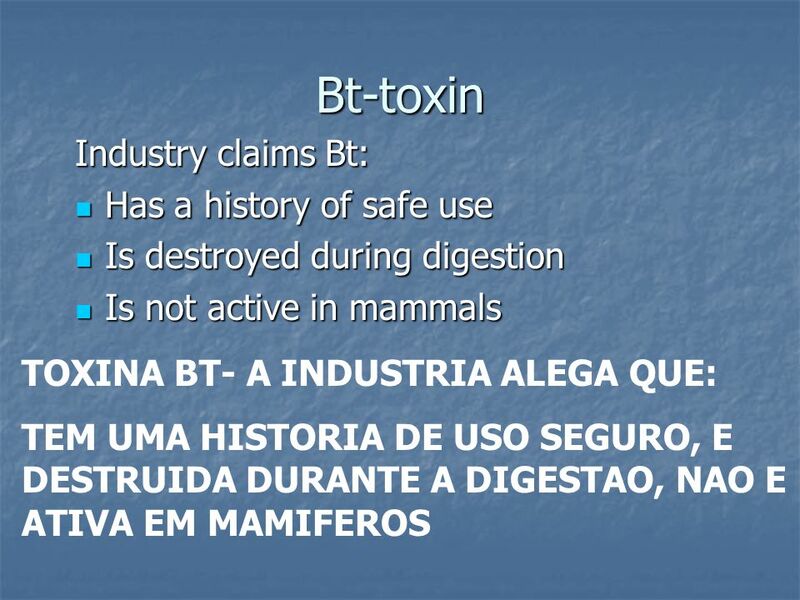 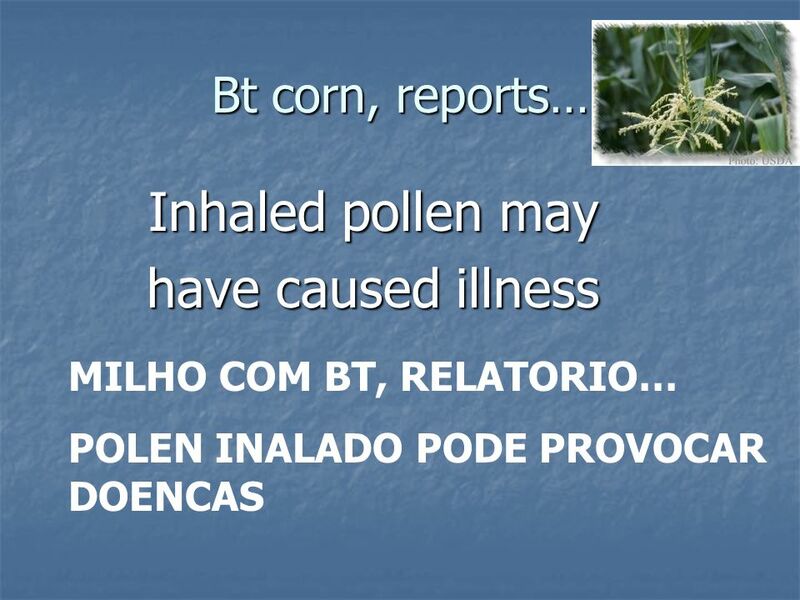 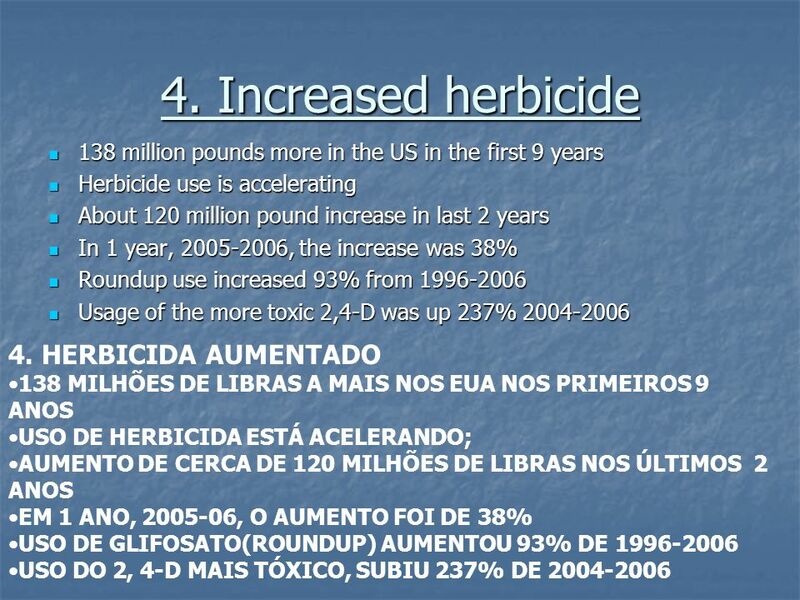 — 2004 study by three agriculture organizations REDUÇÃO DO LUCRO DO PLANTADOR EM 2004, PLANTADORES DE ALGODÃO BT NA CHINA GANHAM SIGNIFICATIVAMENTE MENOS DO QUE PLANTADORES NÃO-BT (ESTUDO DA CORNELL UNIVERSITY) DURANTE 3 ANOS EM ANDHRA PRADESH, FAZENDEIROS NÃO-BT GANHARAM 60% MAIS (ESTUDO DE 2004 POR TRÊS ORGANIZAÇÕES DE AGRICULTURA. 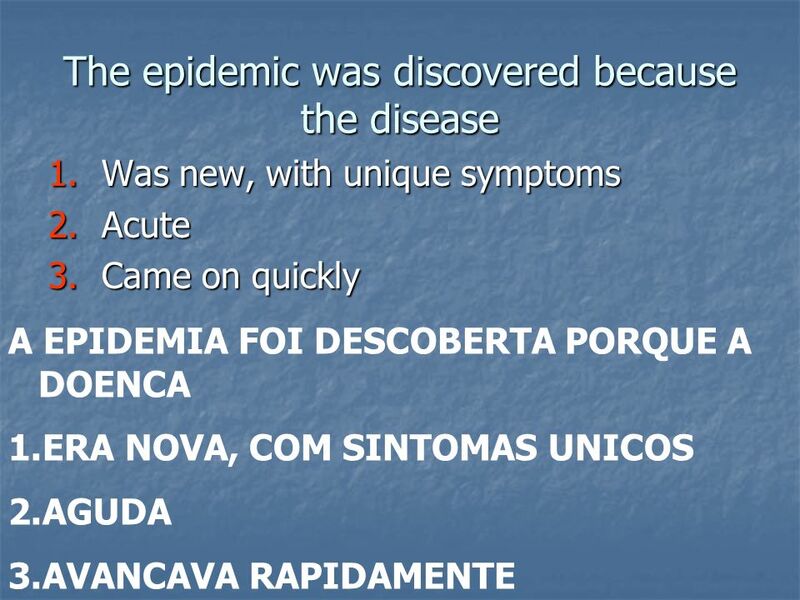 Venezuela, Angola, Zambia, Sudan, etc. 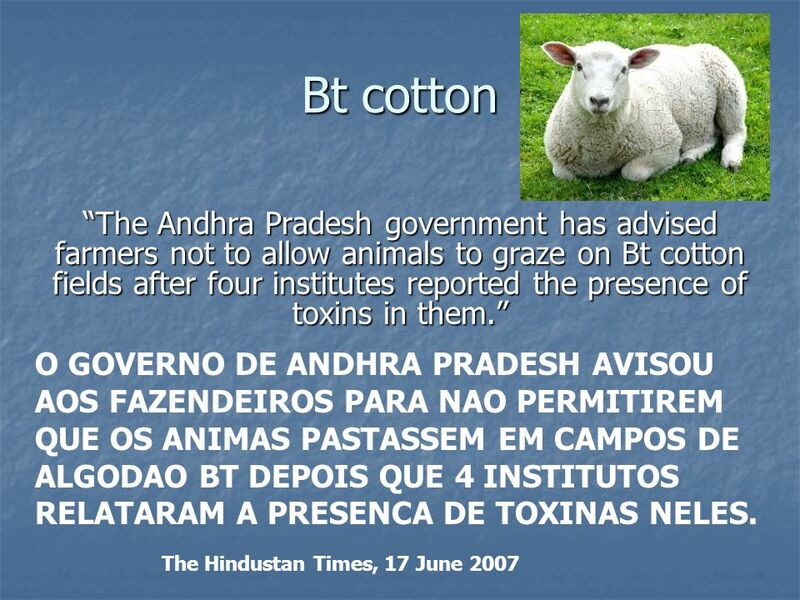 States and regions in Australia, New Zealand, US, etc. 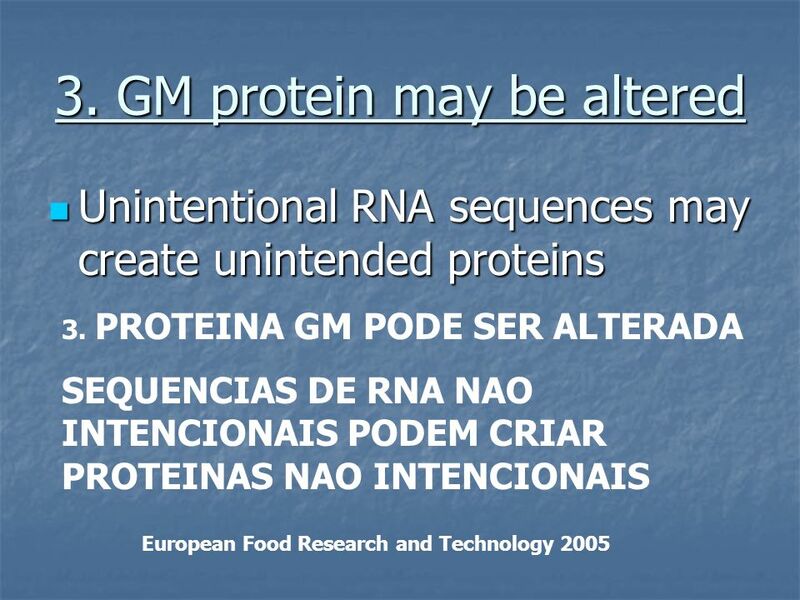 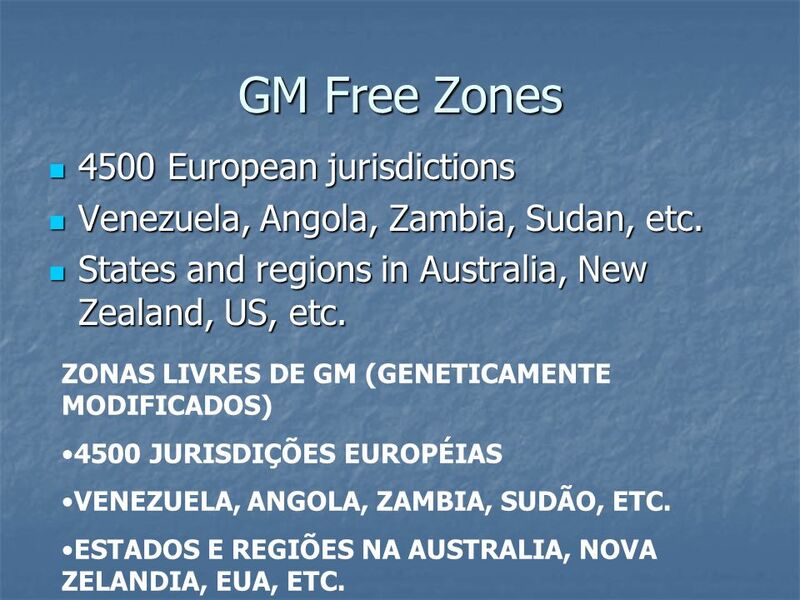 ZONAS LIVRES DE GM (GENETICAMENTE MODIFICADOS) 4500 JURISDIÇÕES EUROPÉIAS VENEZUELA, ANGOLA, ZAMBIA, SUDÃO, ETC. 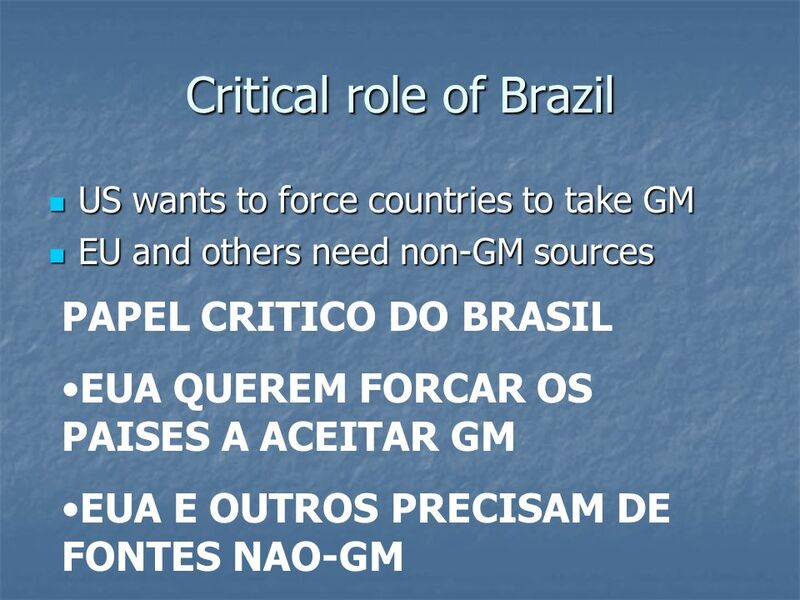 ESTADOS E REGIÕES NA AUSTRALIA, NOVA ZELANDIA, EUA, ETC. 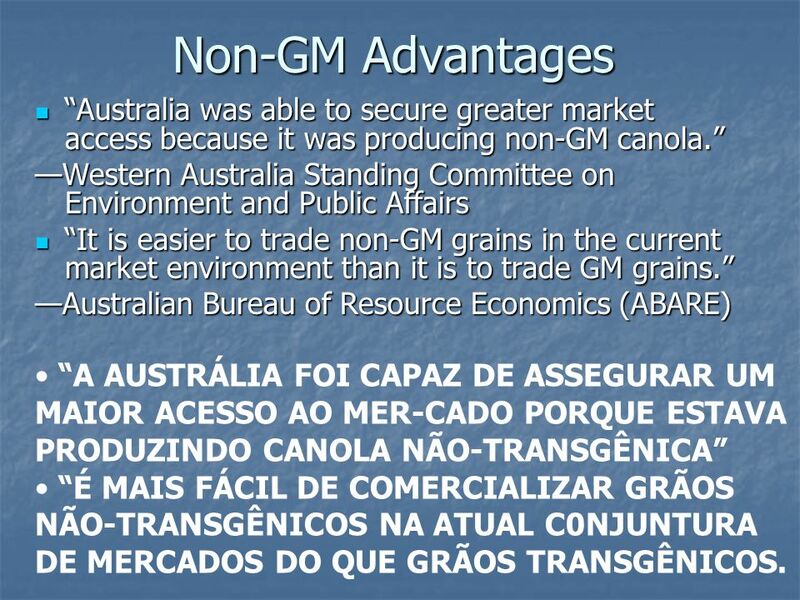 86 Non-GM Advantages “Australia was able to secure greater market access because it was producing non-GM canola.” —Western Australia Standing Committee on Environment and Public Affairs “It is easier to trade non-GM grains in the current market environment than it is to trade GM grains.” —Australian Bureau of Resource Economics (ABARE) “A AUSTRÁLIA FOI CAPAZ DE ASSEGURAR UM MAIOR ACESSO AO MER-CADO PORQUE ESTAVA PRODUZINDO CANOLA NÃO-TRANSGÊNICA” “É MAIS FÁCIL DE COMERCIALIZAR GRÃOS NÃO-TRANSGÊNICOS NA ATUAL C0NJUNTURA DE MERCADOS DO QUE GRÃOS TRANSGÊNICOS. 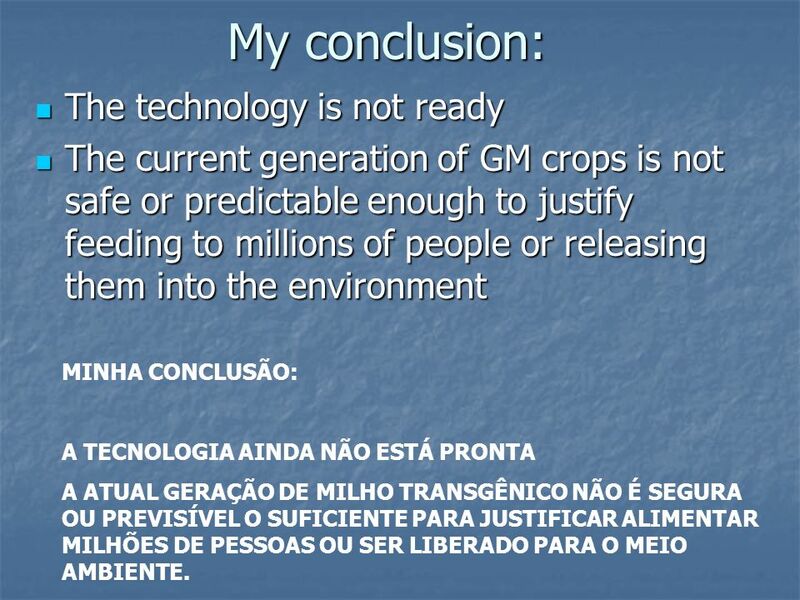 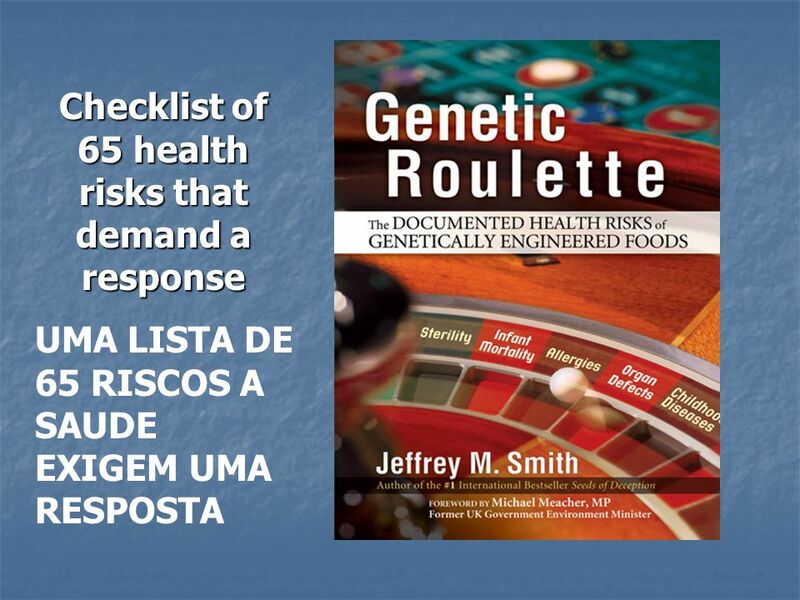 The current generation of GM crops is not safe or predictable enough to justify feeding to millions of people or releasing them into the environment MINHA CONCLUSÃO: A TECNOLOGIA AINDA NÃO ESTÁ PRONTA A ATUAL GERAÇÃO DE MILHO TRANSGÊNICO NÃO É SEGURA OU PREVISÍVEL O SUFICIENTE PARA JUSTIFICAR ALIMENTAR MILHÕES DE PESSOAS OU SER LIBERADO PARA O MEIO AMBIENTE. 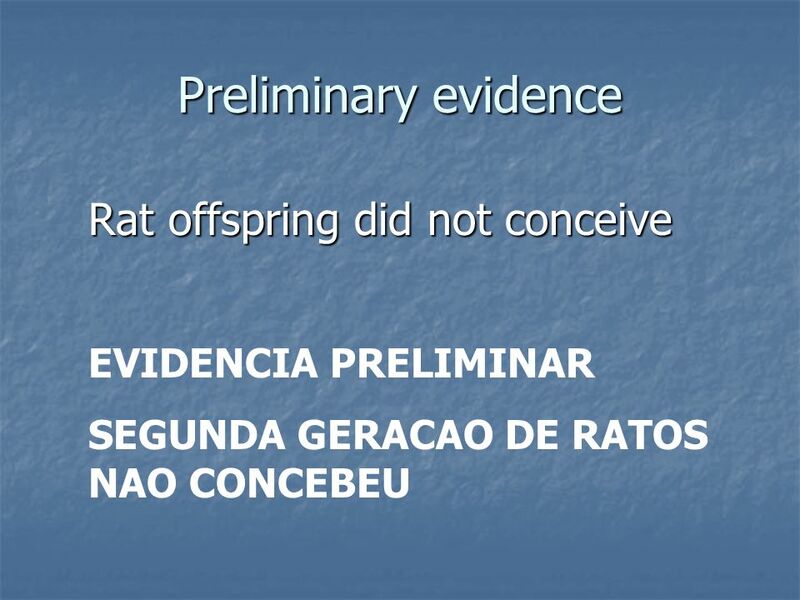 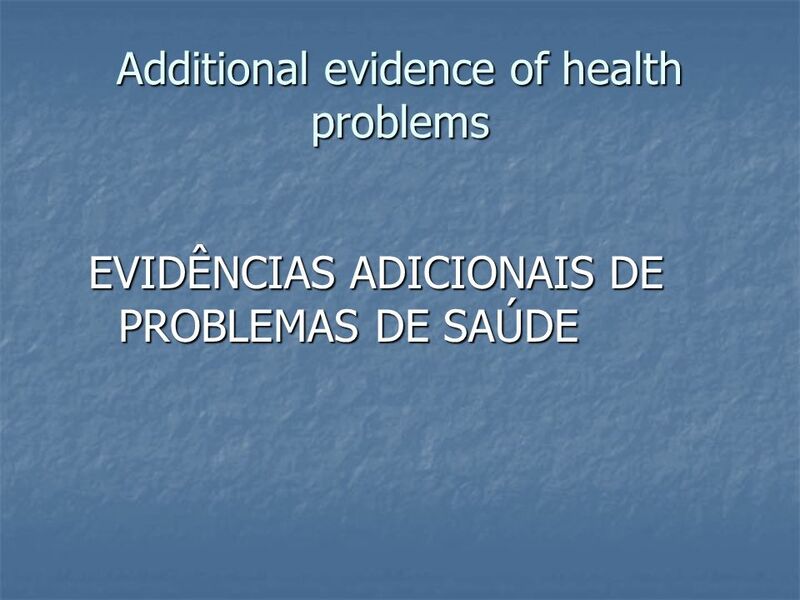 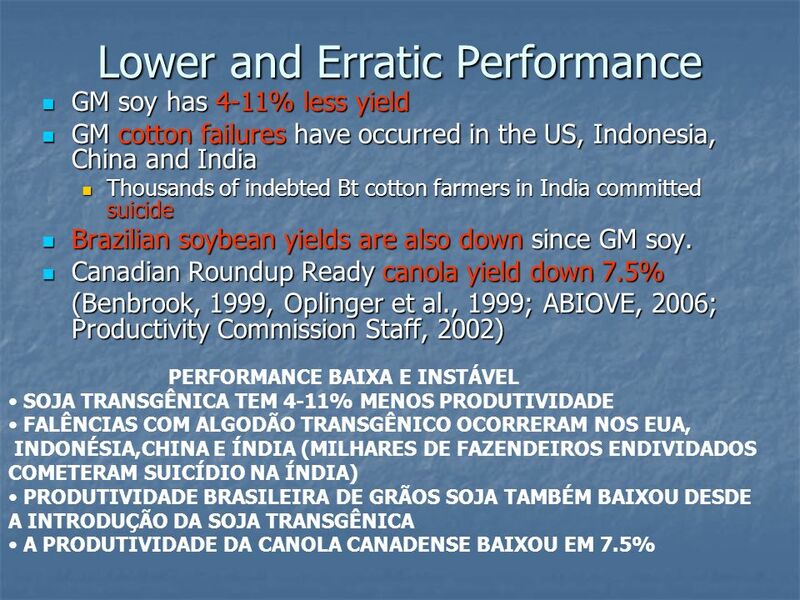 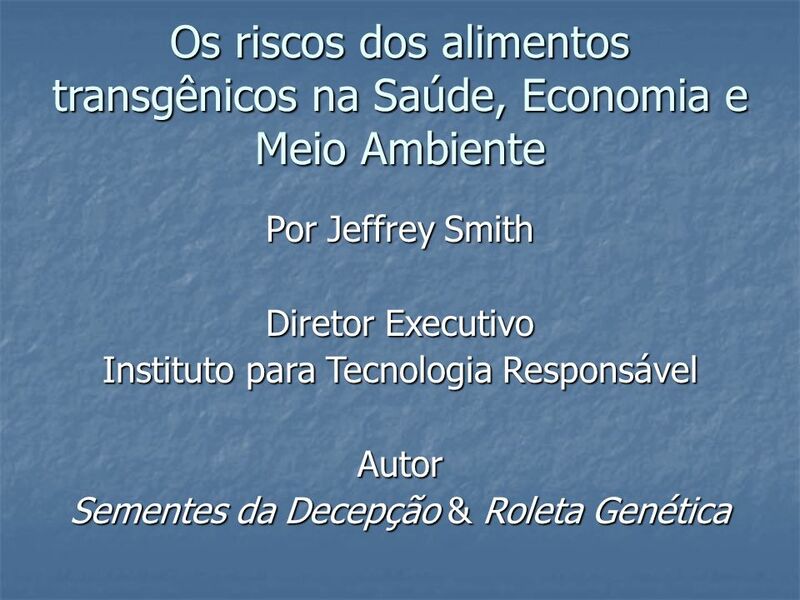 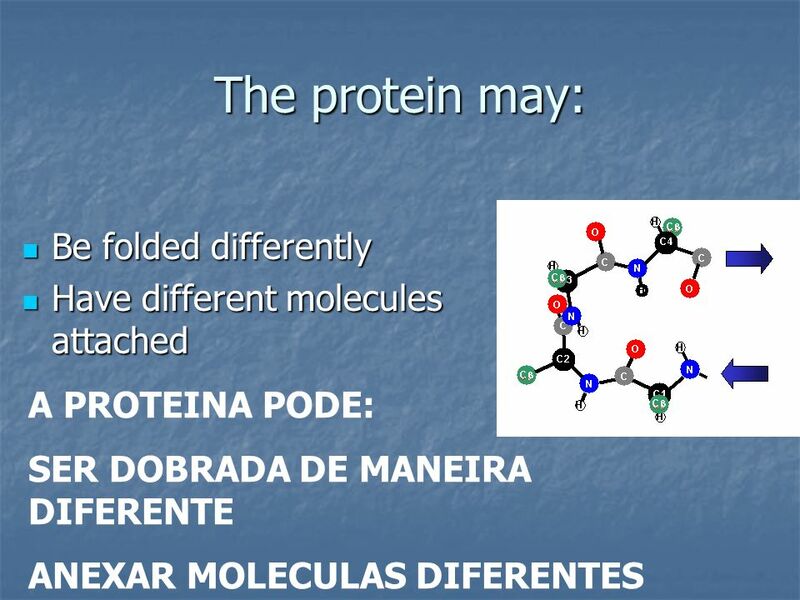 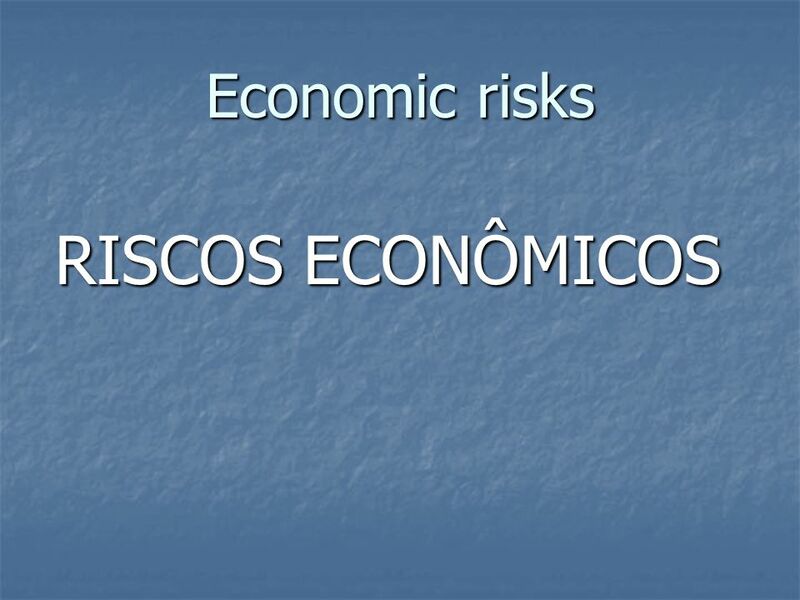 Carregar ppt "Por Jeffrey Smith Diretor Executivo"